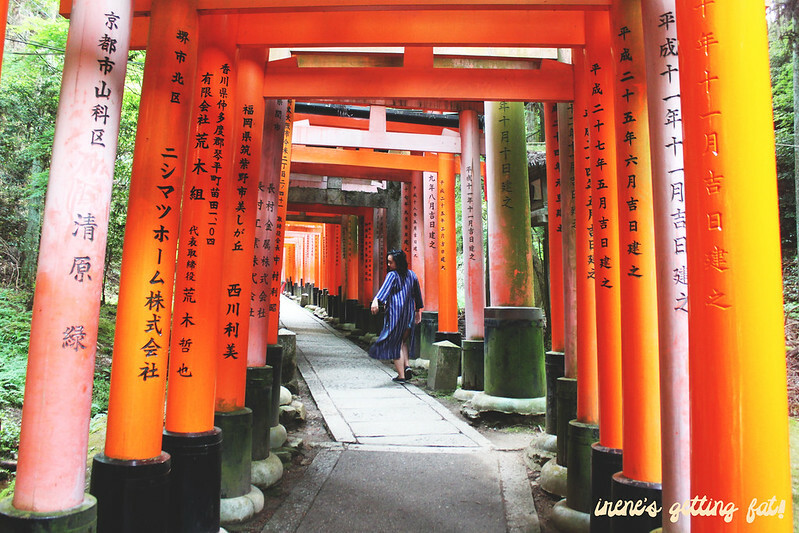 Kyoto is about kimonos, shrines, temples, and the beautiful history of Japan. Cycling is highly recommended here, although if you're not careful about parking your bikes, they may be taken away. Fushimi Inari Taisha. I bet you've seen these famous red gates somewhere in the internet. Arashiyama is located on the western skirts of Kyoto, and has been declared as Historic Site and Place of Scenic Beauty. It's touristy, but still very entertaining. Tenru-ji Temple, along with Arashiyama Bamboo Forest, Gio-ji Temple, and Kameyama-koen Park are among the list of the must-visits of the area. Rent a bike and you can cover more sightseeing. We stayed in Arashiyama Benkei for a night, and I totally recommend it. 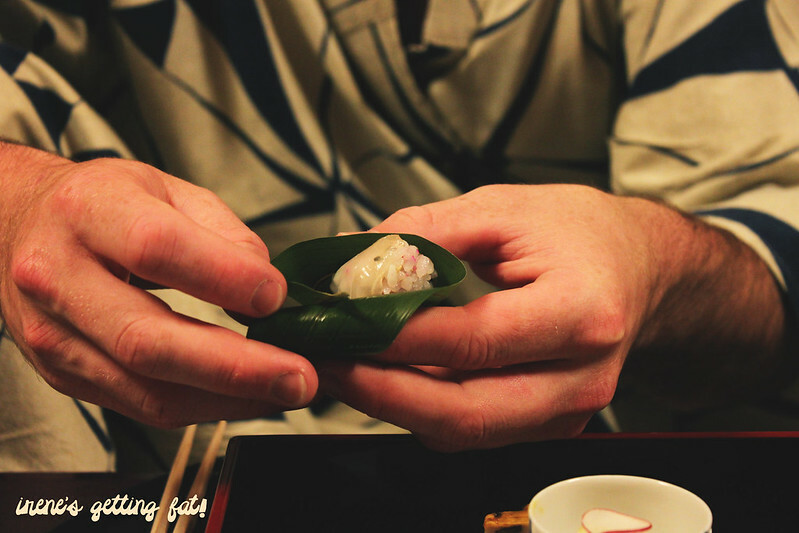 With really nice onsens, impeccable service, and delicious kaiseki dinner and breakfast, it's a great place to relax and have a break of your busy itinerary. 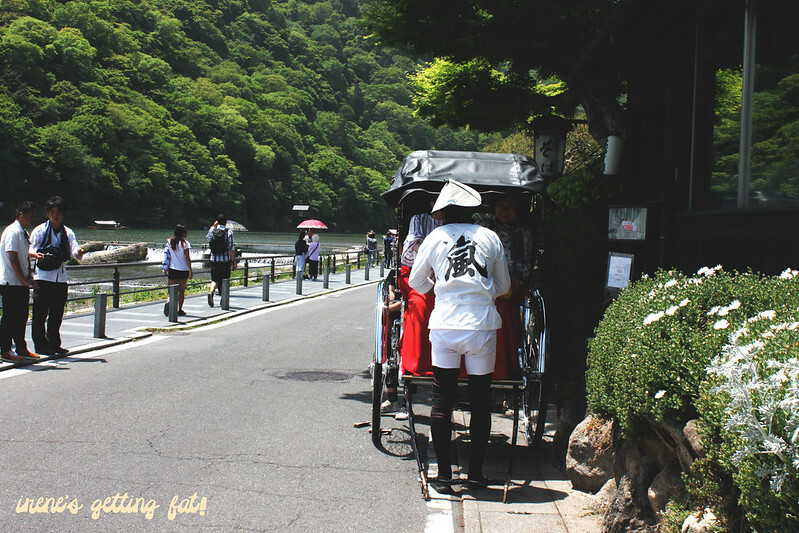 Hand-pulled rickshaw along Oi River, Arashiyama. A monkey and its baby at Kameyama-koen Monkey Park. 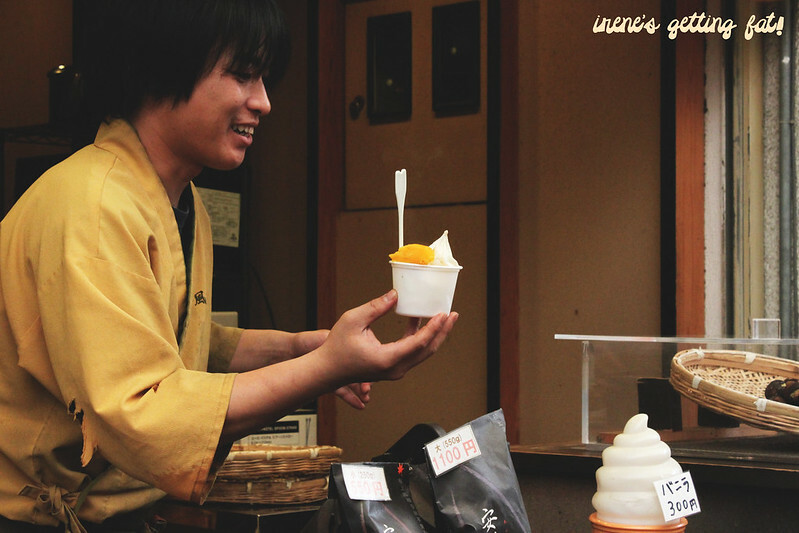 Along the main road, just across Tenryu-ji Temple, there are so many restaurants, snack shops, and souvernir shops. 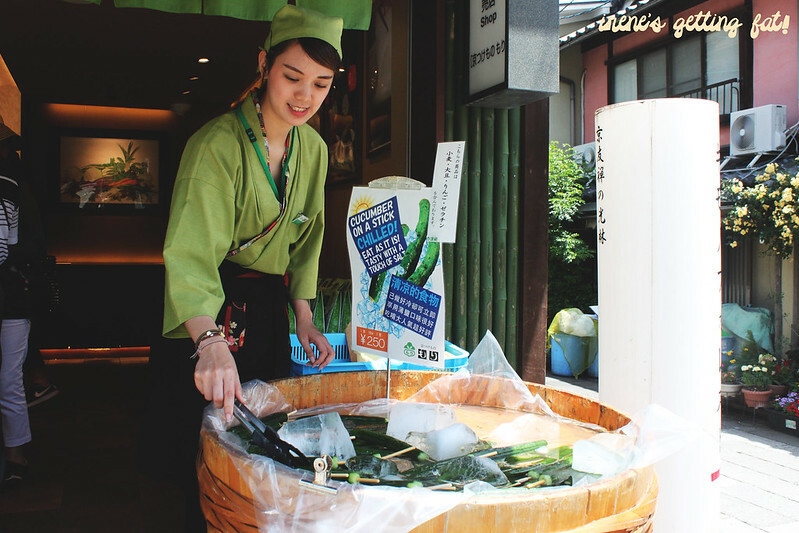 I didn't get to try, but have been wondering how these chilled cucumbers on a stick tastes like! Gold soft serve ice cream, around $10. Novelty, but didn't really taste like anything except vanilla! Soba noodles with prawn tempura -from Iwawo restaurant, just accross Tenru-ji Temple. It's a nice little restaurant with simple but delicious menu. 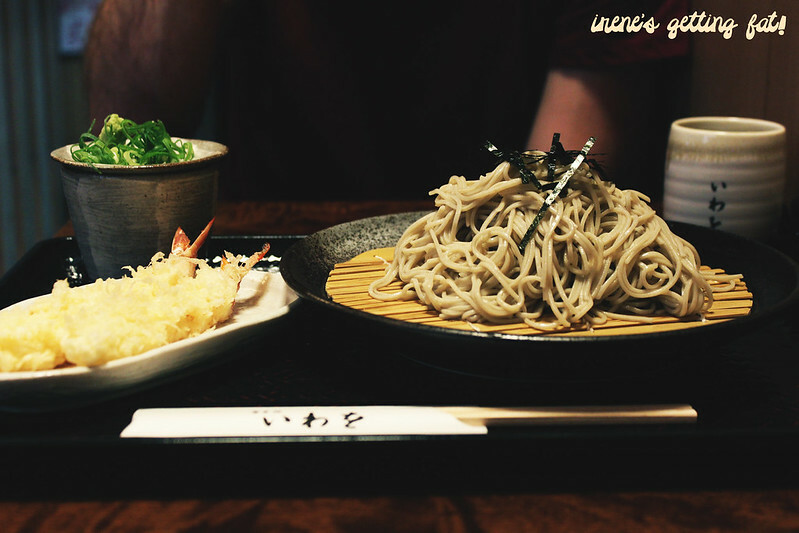 The cold soba noodles come with cold dipping sauce that has great umami flavour. Katsudon - pork katsu on rice and egg mixture. 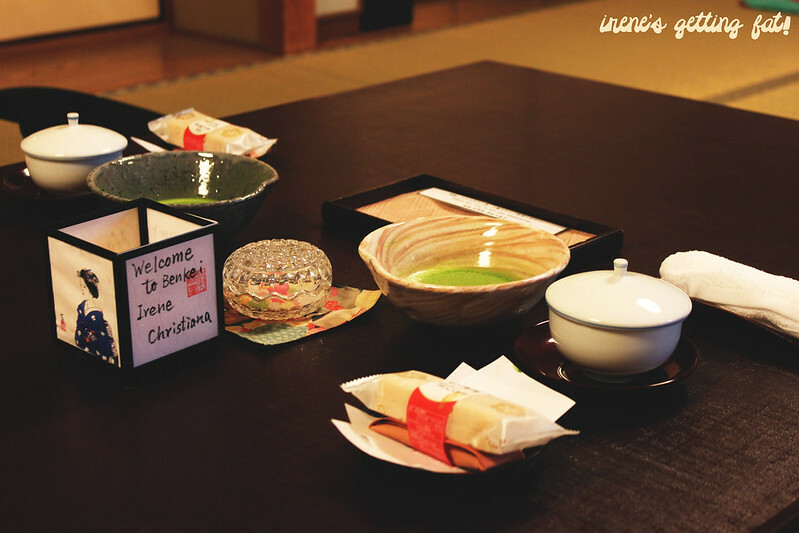 Welcome green tea and snack from Arashiyama Benkei Ryokan. Saza sushi - sushi wrapped in bamboo leaf. 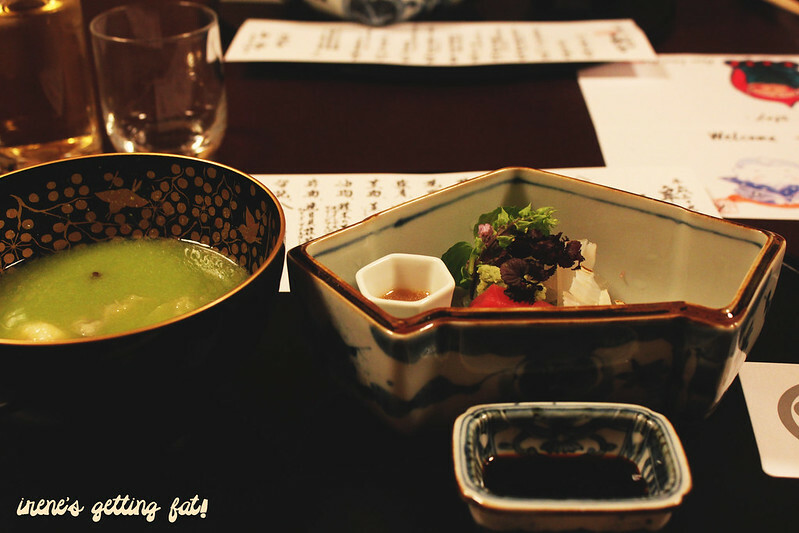 A part of kaiseki dinner. Prawn & seasonal vegetable tempura. A part of kaiseki dinner. Soup and seasonal assorted sashimi. A part of kaiseki dinner. It's a big temple with great view across the city, and it is only a given that many tourists choose this spot to wear kimono and take photos at. 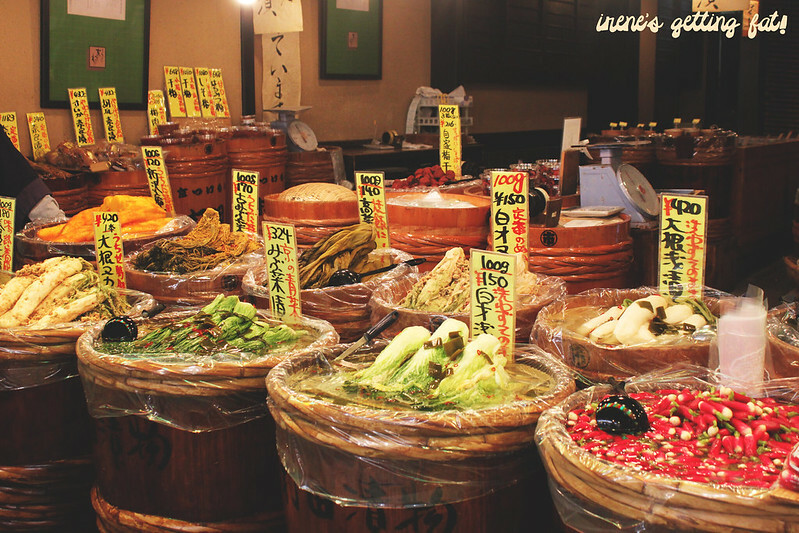 The neighbouring streets of Sannen-zaka and Ninen-zaka should not be missed. 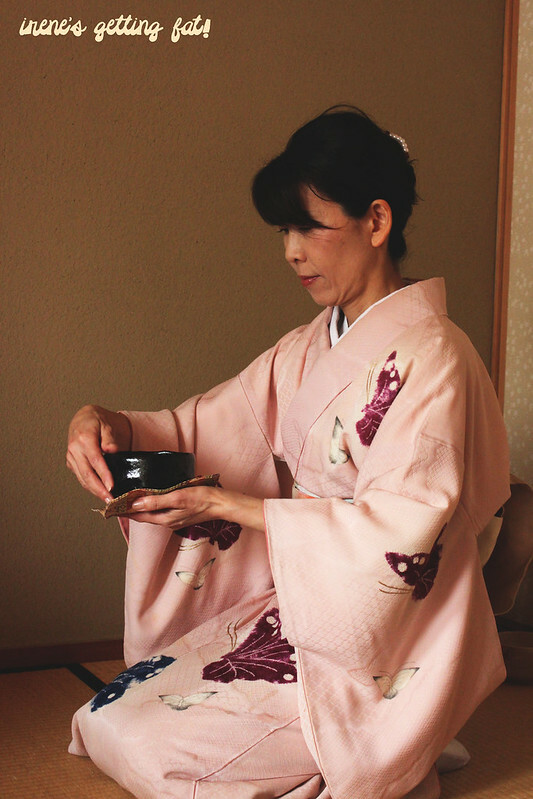 We had a short session of tea ceremony at Camellia, which gave a great introduction of the tea ceremony culture. 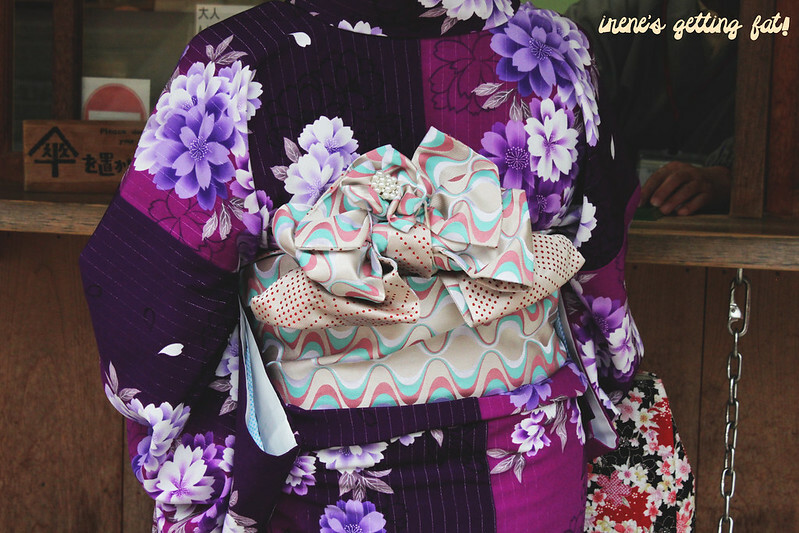 Kimono and its pretty knot. 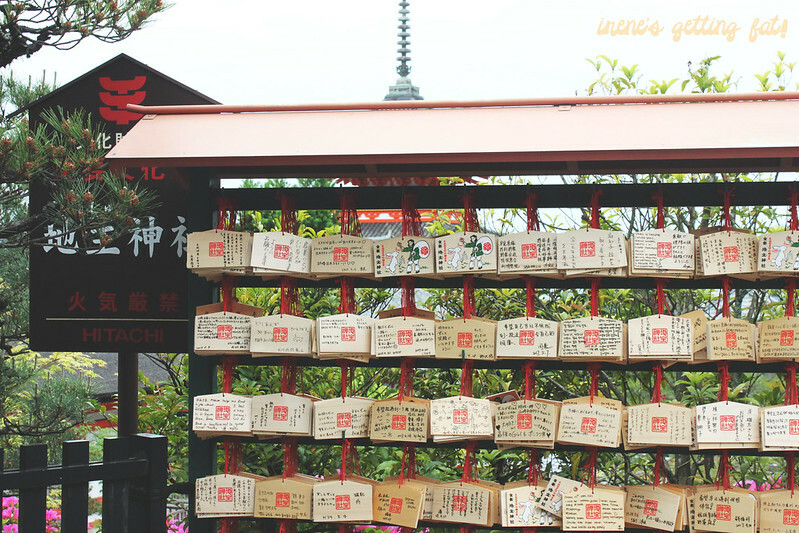 Ema - wishing wooden plaques in Kiyomizu-dera Temple. You write your wish on the plaque and hang it up. 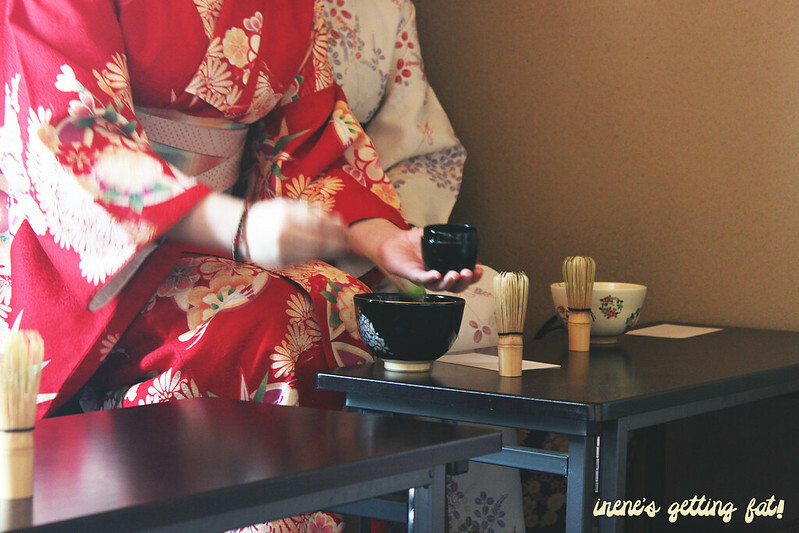 Starting the tea ceremony in Camellia. Mixing the green tea powder. 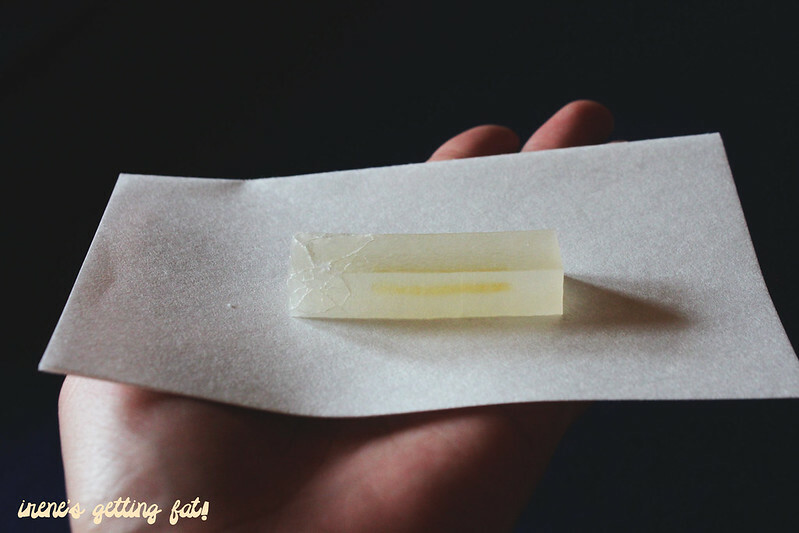 Japanese sweet - sugar jelly with yuzu. 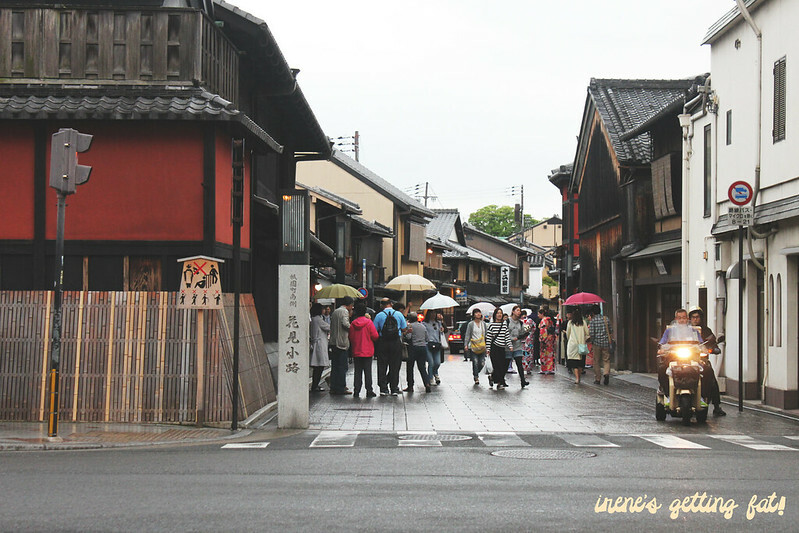 Gion is one of my favourite parts of Kyoto. It's charming with its river and bridge and the trees that frame the bridge, and feels almost sacred somehow. 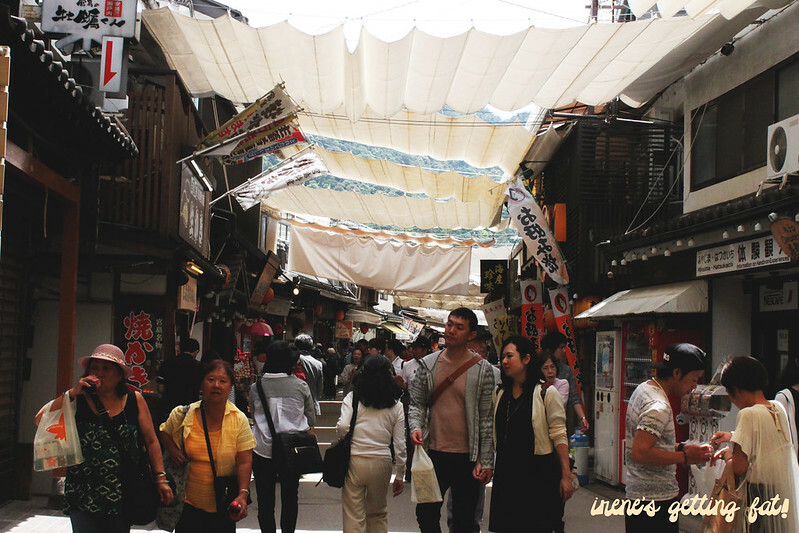 It is the famous spot for geishas, which are hard to spot. 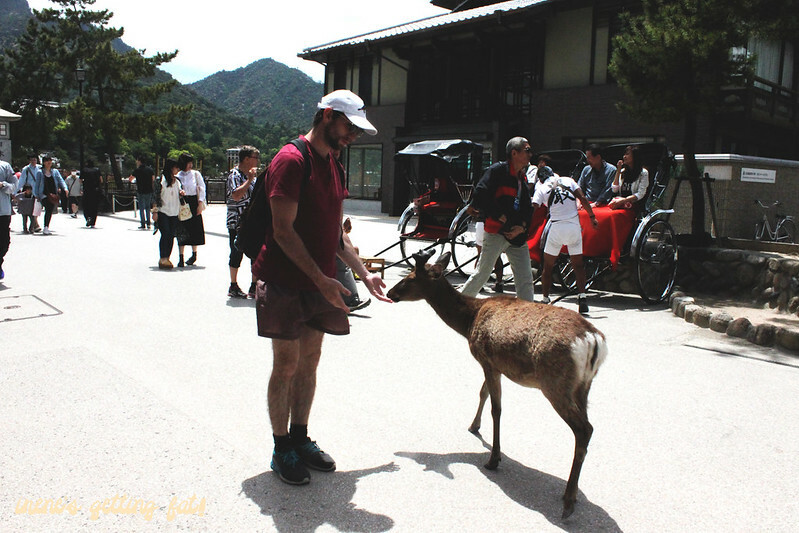 They aren't fancy or eye-catching, so if you see women with flashy kimonos and make up, they're probably tourists dressing up like geishas or maikos. There are lots of restaurants and shops around Gion, and I was lucky to be able to cycle around it and absorb its beauty (I really recommend Cycle Kyoto for this!). We went to Kichi Kichi for dinner but guess what, they were booked for a month. A month????? Far out. 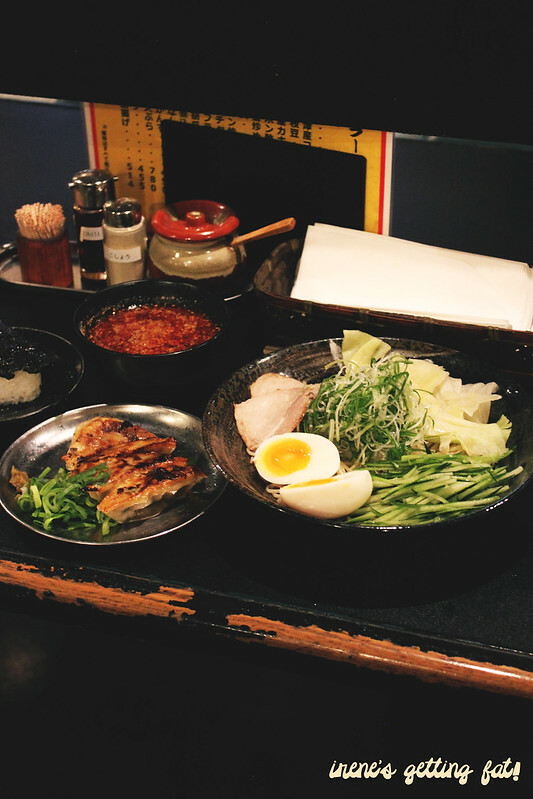 So we went to Torikizoku, a popular yakitori chain restaurant that can be found easily around town. It was a great and chilled dinner, with plates after plates of tasty skewers and glasses of beers that didn't cost us more than $30. Gion and its pretty traditional houses. We went cycling and the tour guide, Kevin, took us to this pretty decent hole-in-the-wall restaurant. 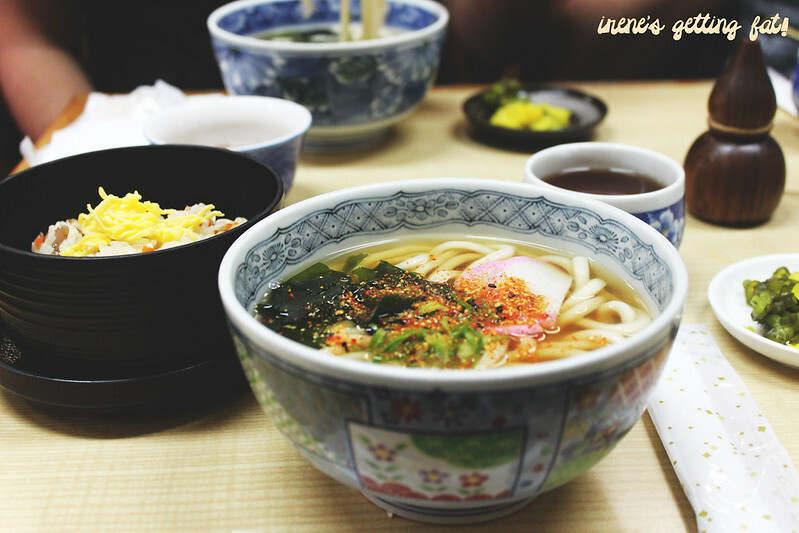 They serve mean udon and soba sets, and the udon soup was the perfect nourishment for 22km cycling tour! 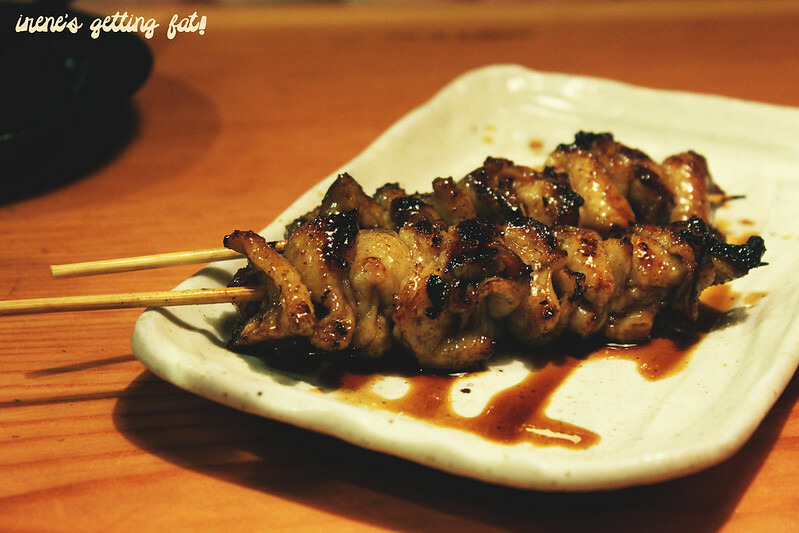 Chicken skin skewers from Torikizoku. All skewer is only around $3 here! 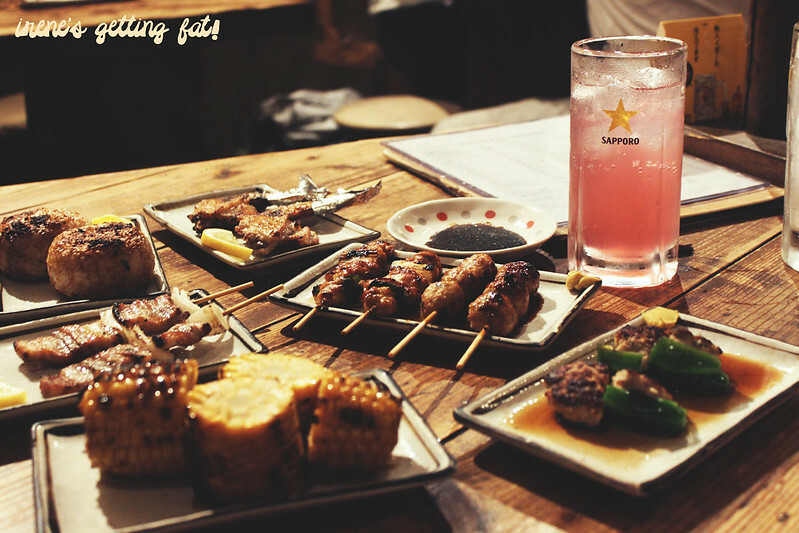 The Yakitori-sauce chicken thigh skewers (momo kizoku-yaki) were our favs (also come in salt and spice flavouring). 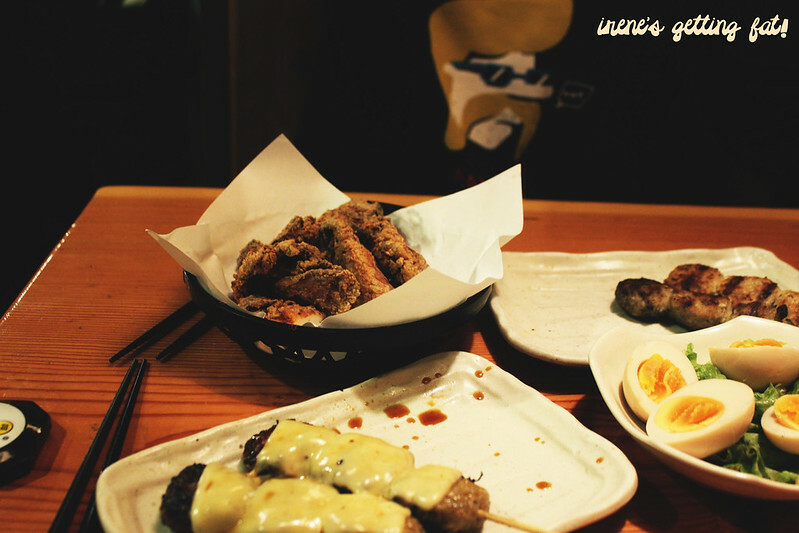 Tsukune cheese skewers (meatballs with cheese), ajitsuken tamago, and fried chicken. The ordering system is so simple - just use the ipad on every table and they will bring the food to you. 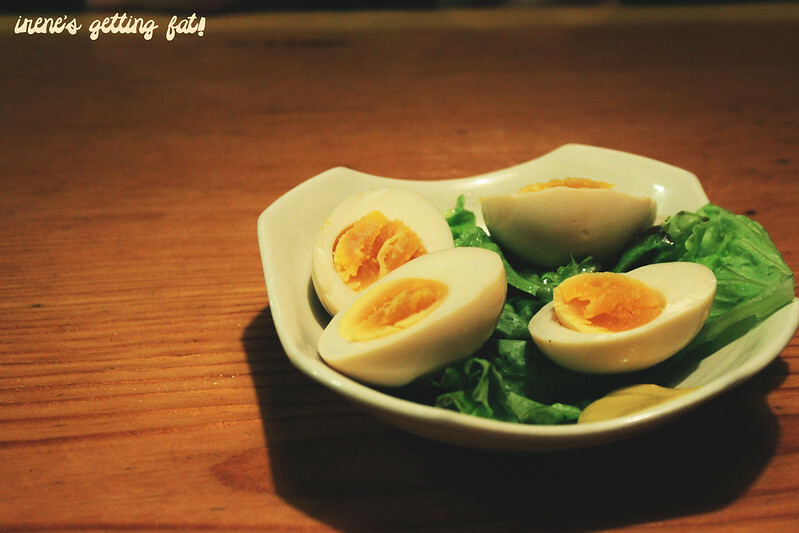 Ajitsuken tamago (seasoned boiled egg). 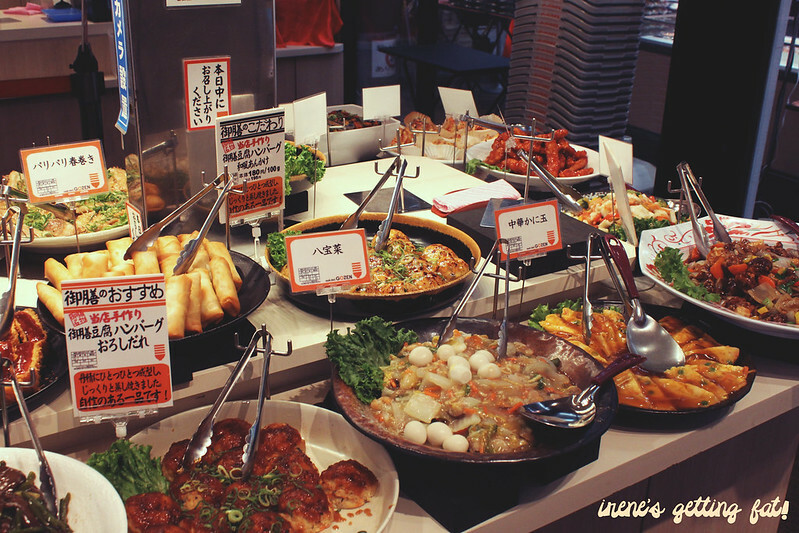 Daimaru Department Store is well known shopping spots in Japan. They're everywhere, and they're massive. I wasn't interested in the branded clothes or the fancy shoes, I was there just for the last floor of the department store: the food center. It is heaven, full stop. 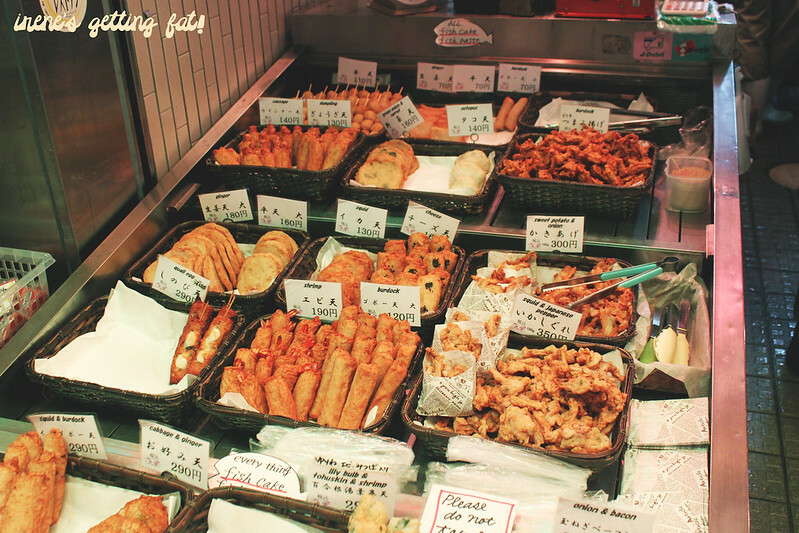 Bakeries, pickles, sweets, butchers, side dishes - name it they have it. They even have expensive fruits. Like, really expensive. $100 melons? $200 watermelon? Whatever tickles your fancy, guys. Making such a delicate sweets/cake in Daimaru Department Store food floor. There are multiple cake shops with unbelievably eye-catching cakes on display. 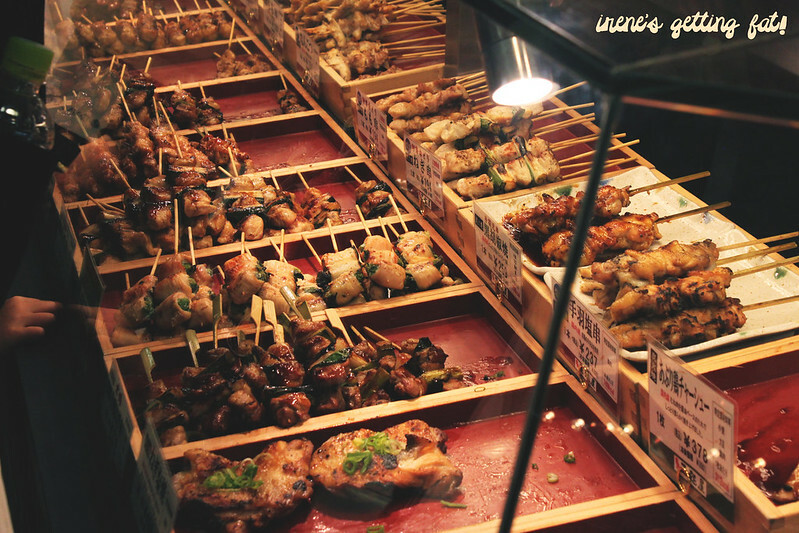 Display of yakitori (skewers). So tempting. 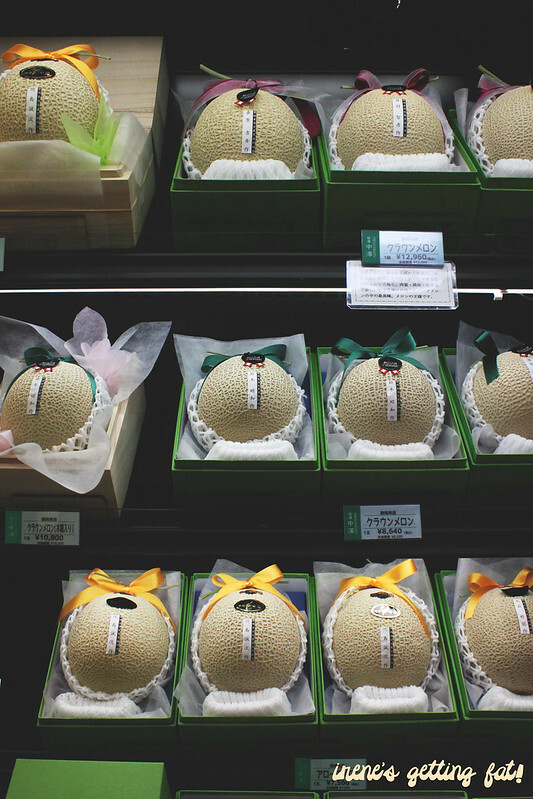 Super expensive, precious melons on display. I didn't even dare touch it. 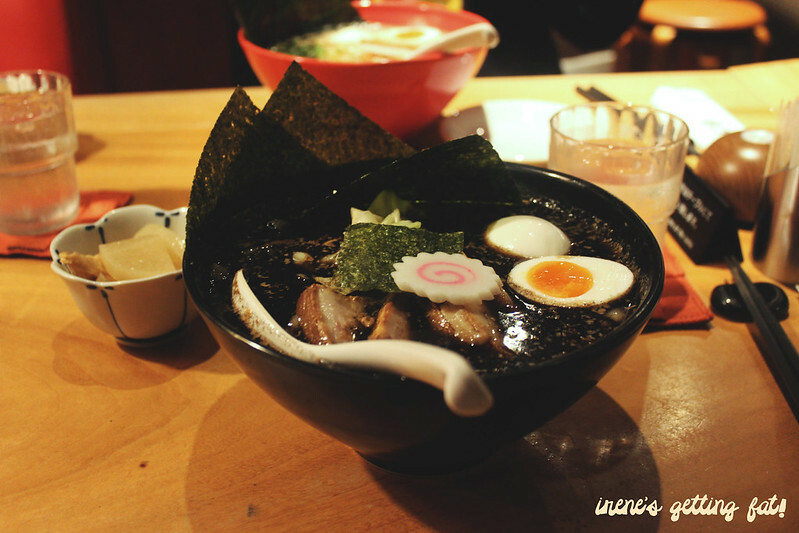 Kyoto's burnt miso ramen is something that has intrigued me for a long time since I saw it on Ramen Raff. It really did not disappoint, as my bowl of kogashi miso ramen (burnt miso ramen) was incredible. It was thick, rich, and the smoky sensation made it even more satisfying. 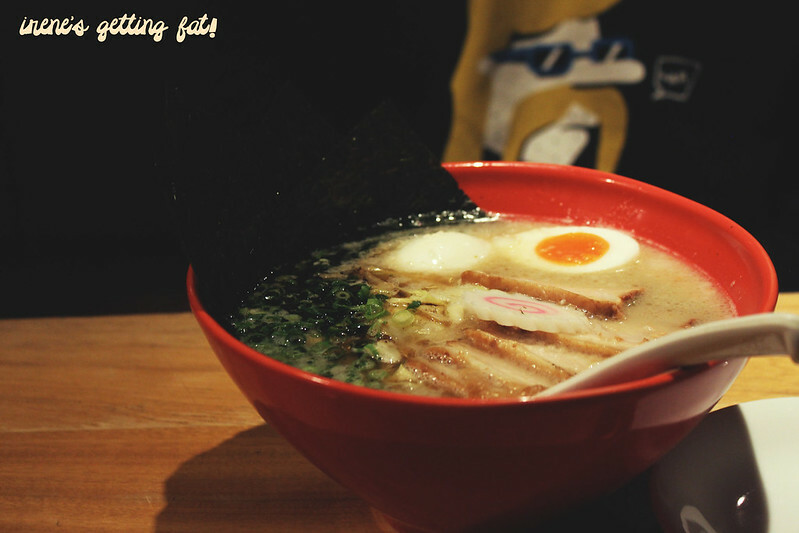 David's soy tonkotsu ramen was slightly less bold, but still very tasty and flavorsome. Kogashi miso ramen, Kyoto Gogyo. 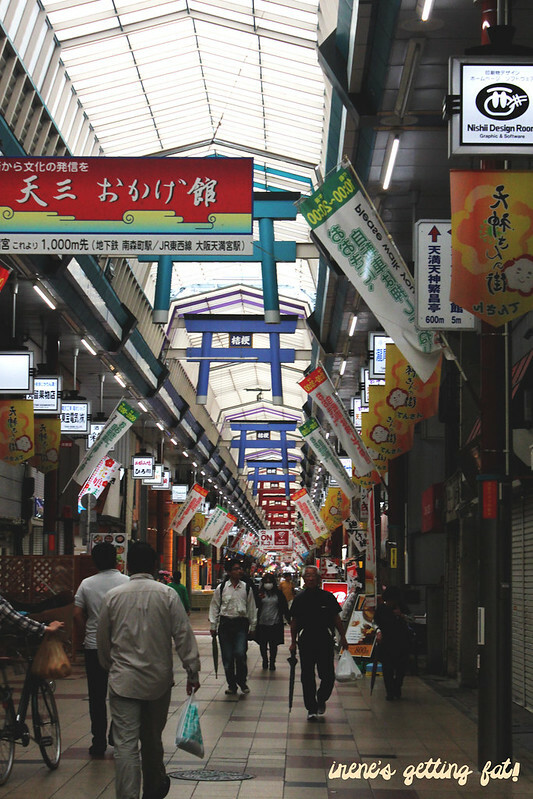 It's a five block long marketplace, home to hundreds of shops and restaurants. Kyoto Gogyo is around here too, making it very convenient. I can spend days here, it's almost like it's endless! 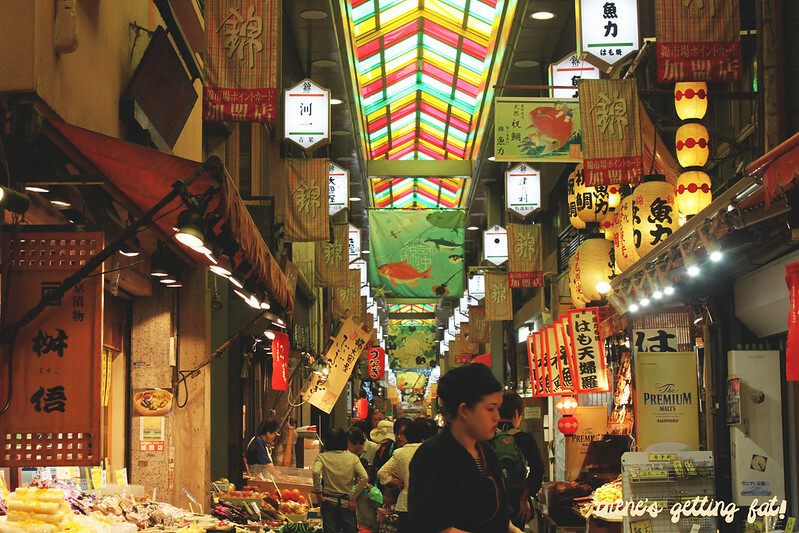 Inside Nishiki Market. Such a feast for the sight, smell, and taste! 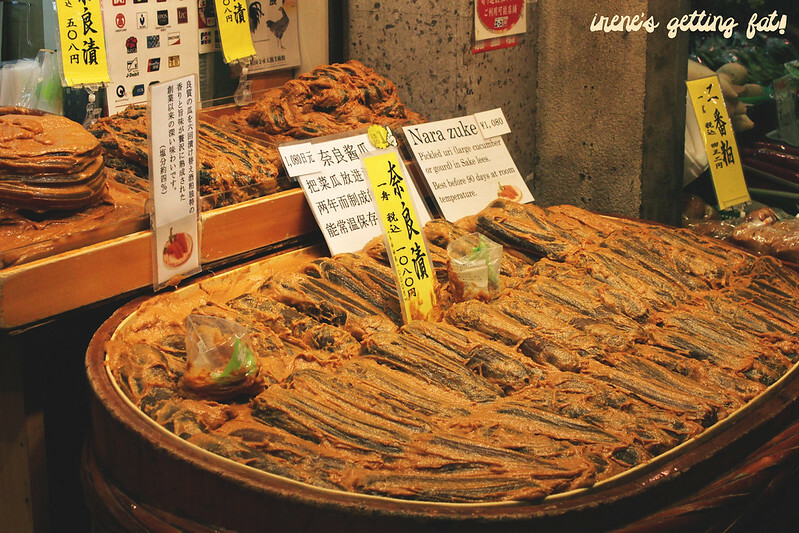 Narazuke - deep brown pickles made from daikon or cucumber fermented in sake lees, giving it pungent aroma and alcoholic bite. Arrays of fish cakes, ready to eat. 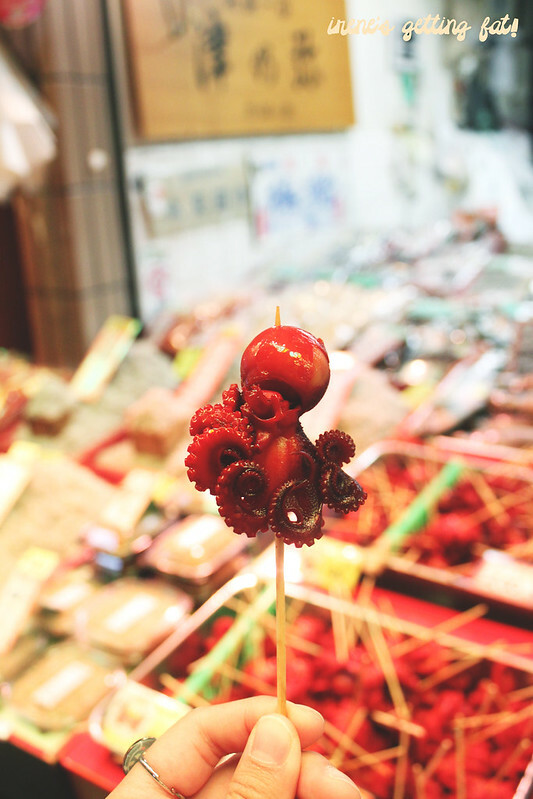 Baby octopus on a stick. Very fishy. 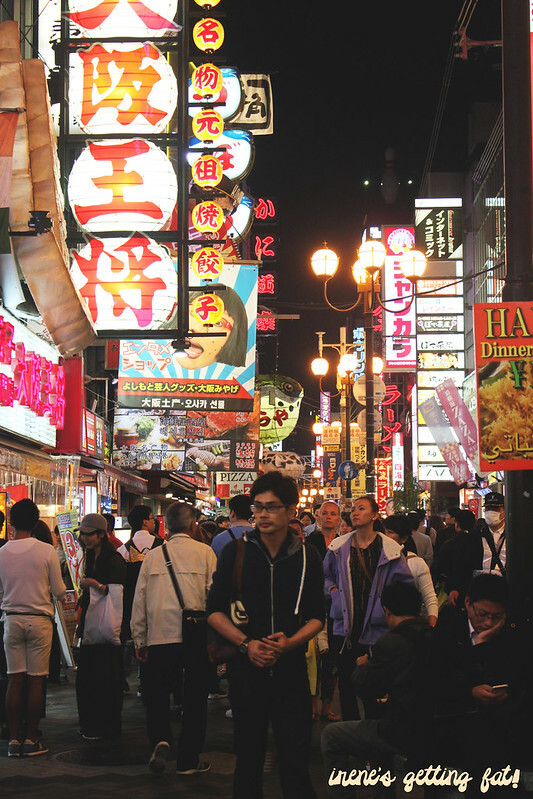 Osaka is another big, bustling city. 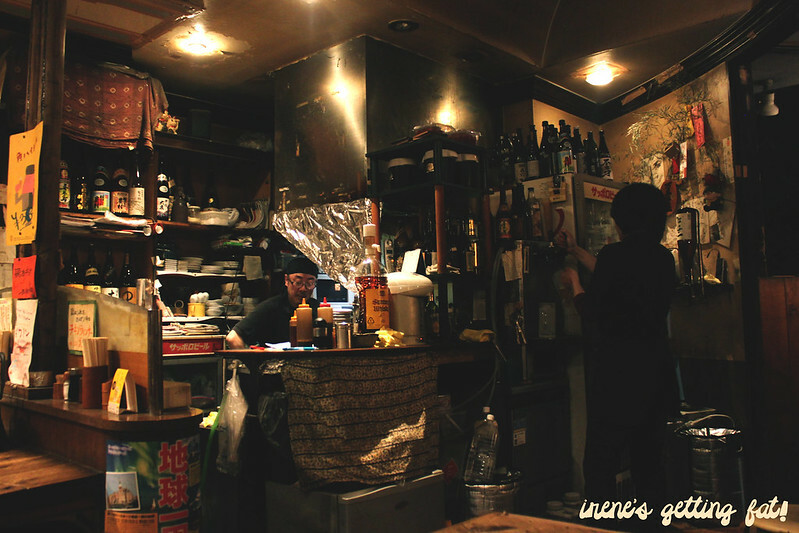 It is different than Kyoto's more peaceful, traditional vibe, and it actually reminded us of Tokyo. 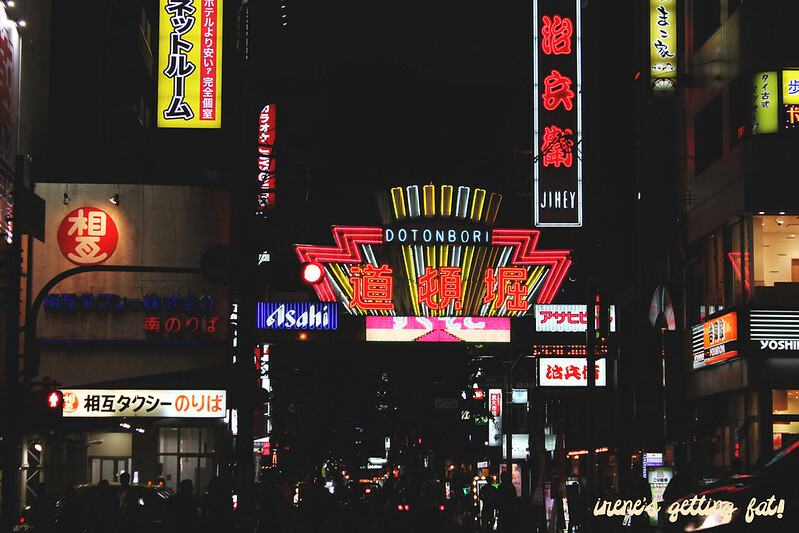 Den Den Town (electronic centre), America Mura (western fashion & styles), and Osaka Castle are only a pinch of what Osaka has to offer. Special ramen from Menya Kuramasa, Tempozan Marketplace. BTW, I totally recommend Kaiyukan Osaka Aquarium! 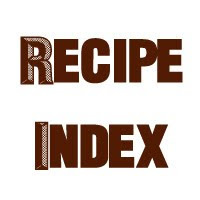 Small izakaya joint next to Nishi Nagahori Sta - friendly owners and great service. It's a shame I didn't catch the restaurant's name. They even have English menu! It's simple but satisfying. Really loved the chicken skewers. As a big fan of Harry Potter, this was not something I could miss. 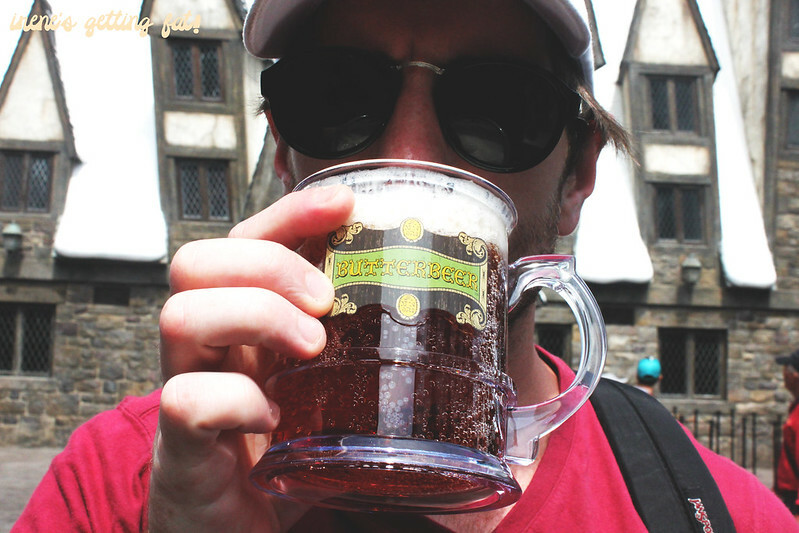 I finally got my hands on the famous Butterbeer, non-alcoholic, refreshing soft drink with delicious buttery foam on top. Go around and you'll find more cute food; from Hello Kitty buns, minions buns and ice cream sandwich, to cookie monster sandwich. I just didn't have the patience to stand in such long queues for those items. 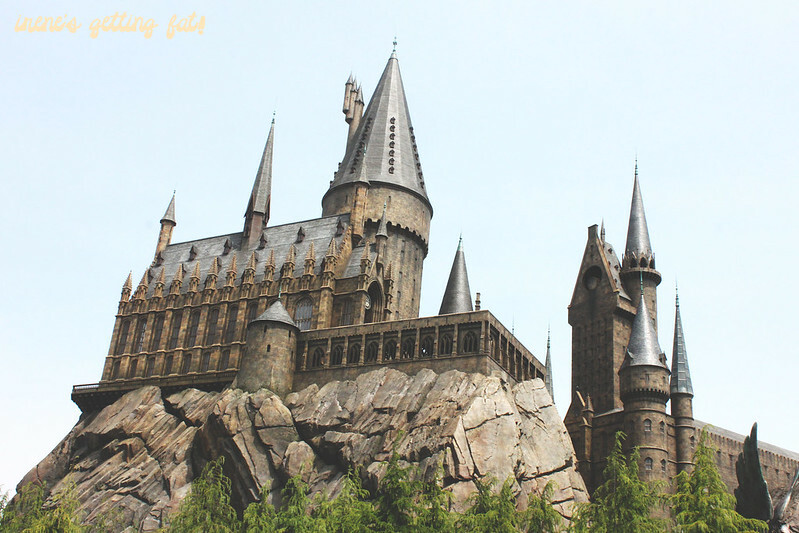 Hogwarts Castle at Universal Studio. Where magic happens. 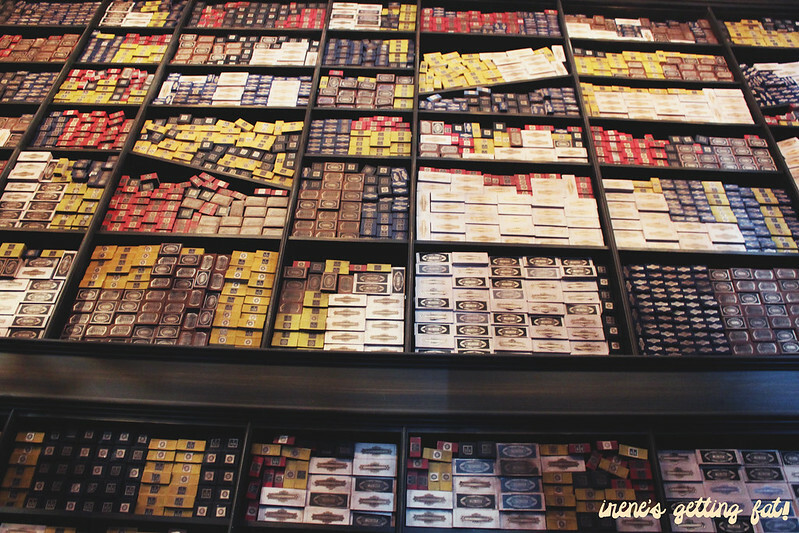 Selections of wands at Ollivanders, the wand maker. 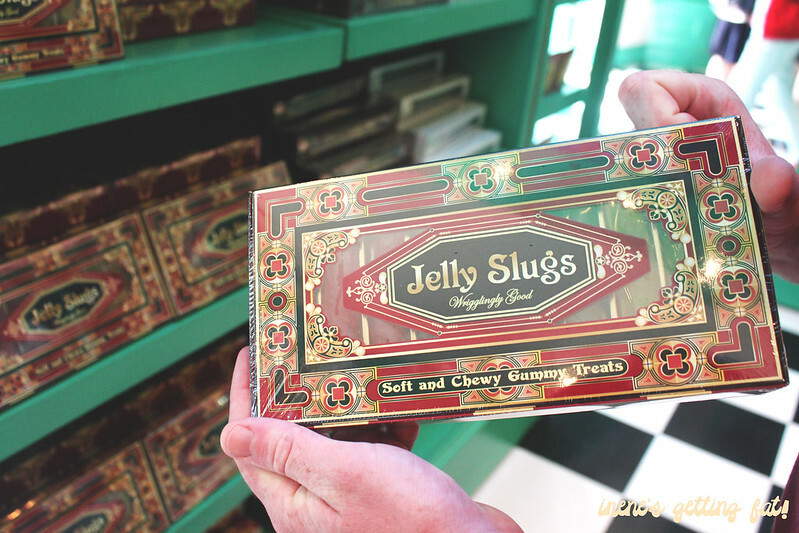 Jelly Slugs from Honeydukes. They also have chocolate frogs! 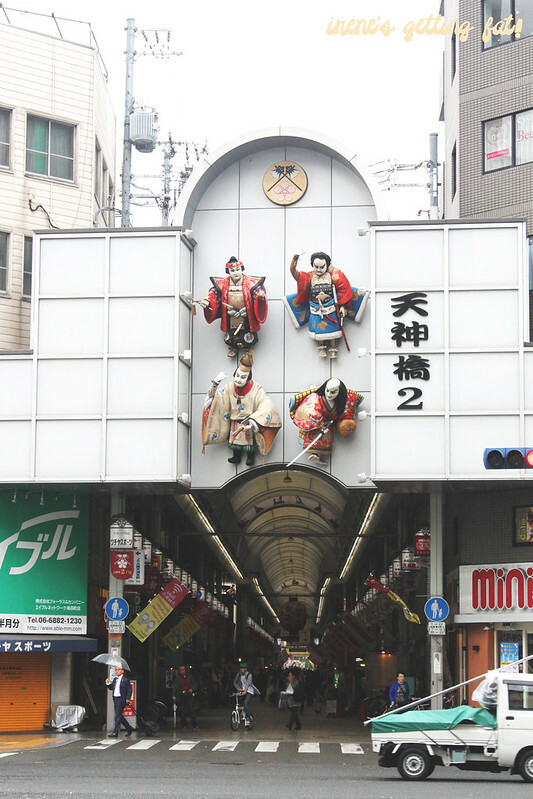 The longest shopping arcade in Osaka, that is not alive before at least 11 a.m. Come after this time to find multiple shops full of souvernirs, clothes, etc as well as pachinko and slots centres. Inside the shopping street. Not many were open that day, we were too early! 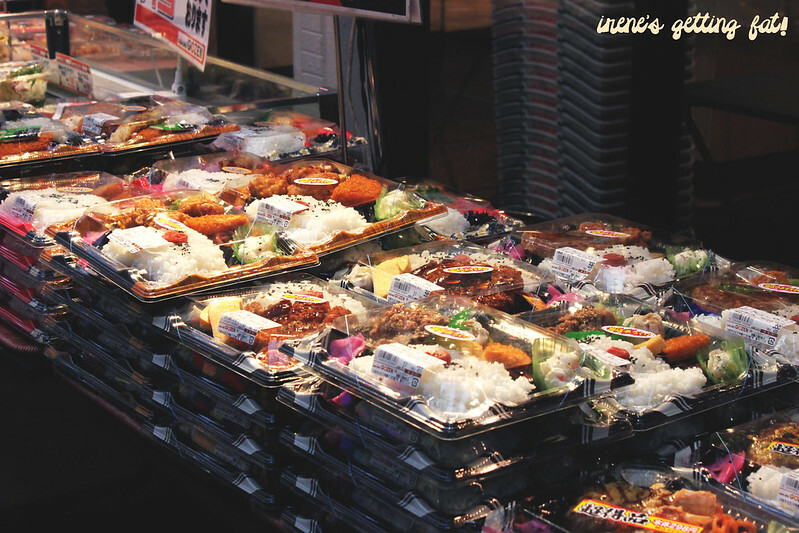 Lunch boxes and side dishes shop in the shopping street. Side dishes on display. Just grab a plate/takeaway box and fill it up with as many dishes as you'd like. So many options! We stopped by a cheap udon restaurant for breakfast. Again, I failed to take note of the restaurant's name. My curry udon with raw egg was absolutely delicious, ready in 2 mins and warmed my belly right up. There wasn't any meat in it, I asked for kakiage (vegetable fritter) which was hidden under the thick curry. 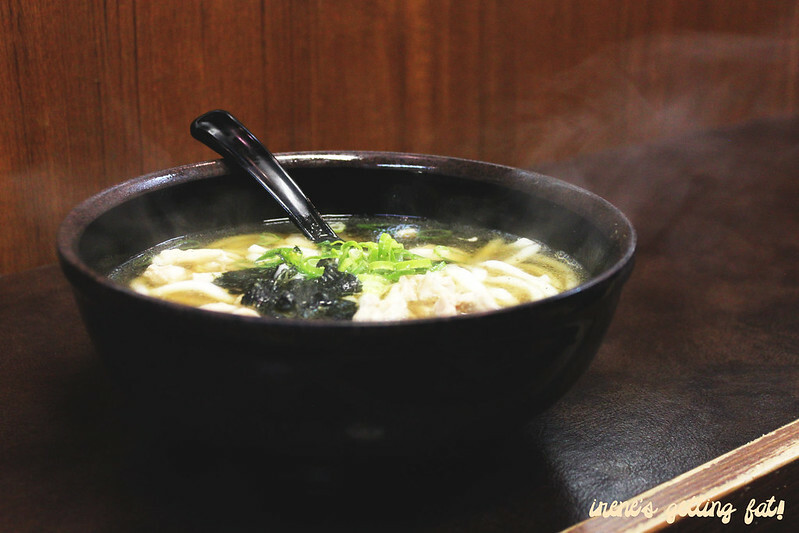 The chicken udon was very much like chicken soup. Heartwarming. One bowl actually cost us less than $5. I'm totally embracing my inner child and succumbed to the cuteness of Gudetama, the lazy egg. The cafe screams cute from all corners, the food & drinks are, surprisingly, not overprices for what you get. I just had lunch and had to settle with Gudetama parfait. Otherwise I'd order the cutest Gudetama fried rice. 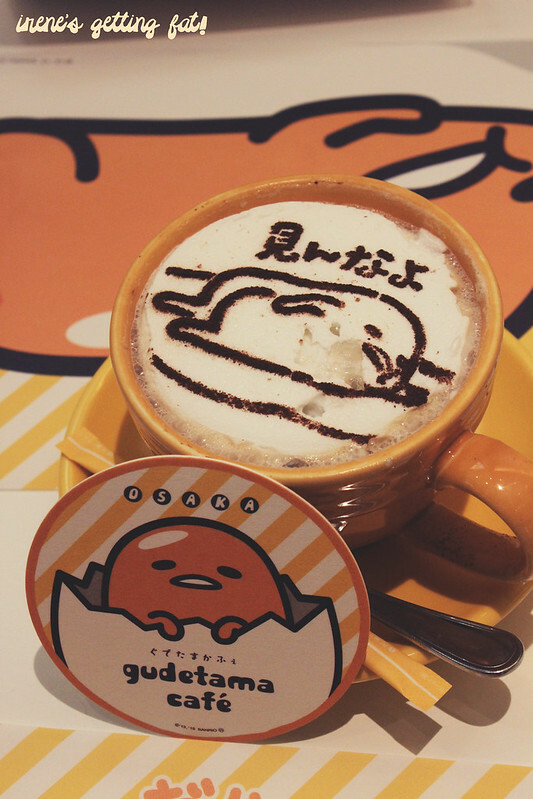 Gudetama cappuccino. Watery coffee that needs sugar. 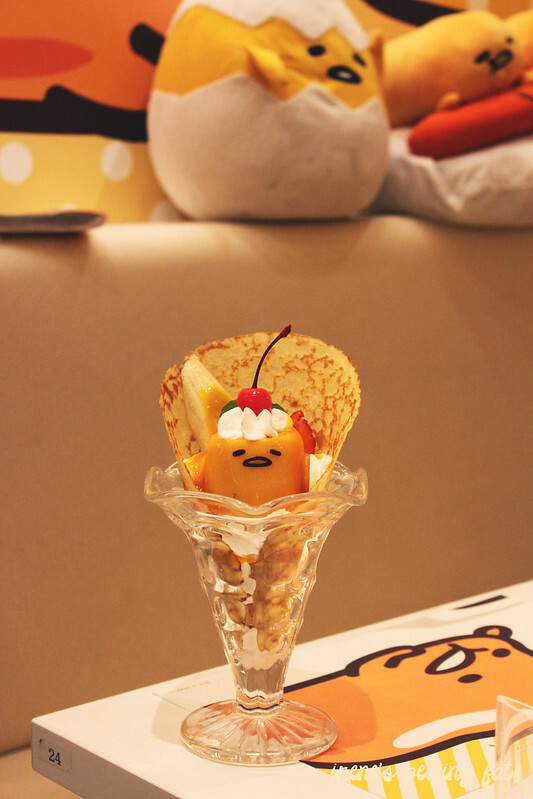 Gudetama parfait. There was a mango pudding in it, with ice cream, whipped cream, mango sauce, and many more things. Novelty. America Mura is such an interesting place. It's full of locals and tourists alike, and everybody seem to be very stylish. Imagine fishnet stockings with lace bra on top of a denim dress, or unusual body piercings and inked iris. 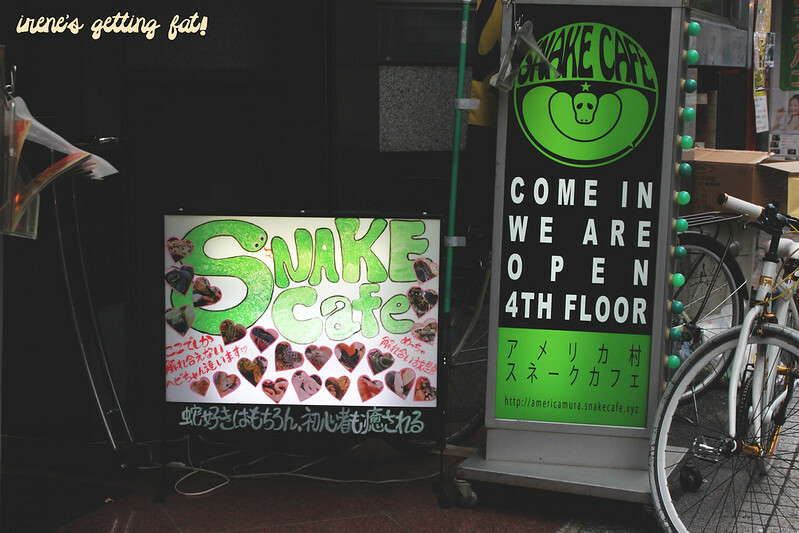 And, guess what, they even have snake cafe (yes, you go in to hang out with snakes). People watching is number 1 activity I recommend here. 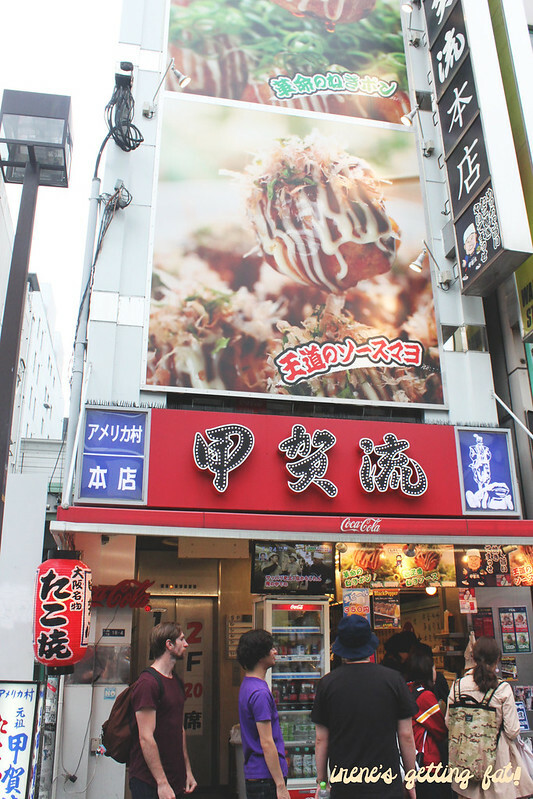 I was there, however, to check out Kogaryu, takoyaki joint that is so popular that has made their way to Michelin guide.When I was there, the line was thankfully not long and in no time we got our portion of original takoyaki. They were extremely hot inside, but fluffy and tasty. 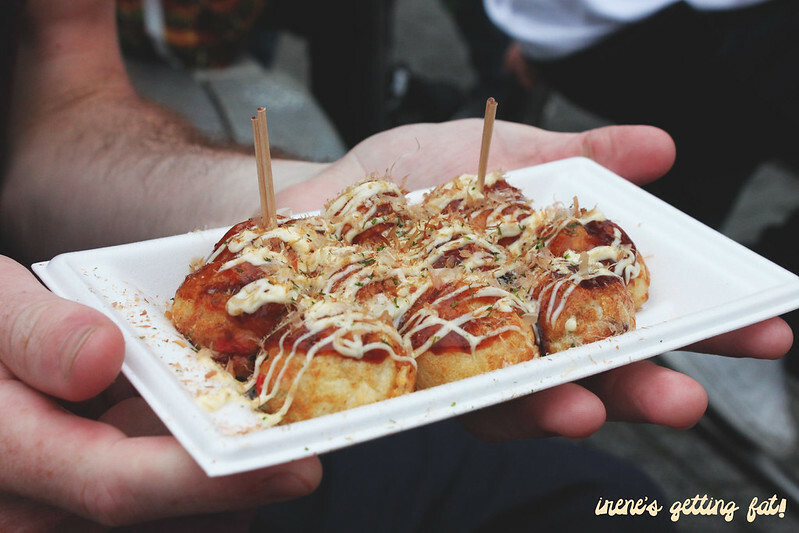 I personally like crispy edges takoyaki, but these ones weren't bad at all. 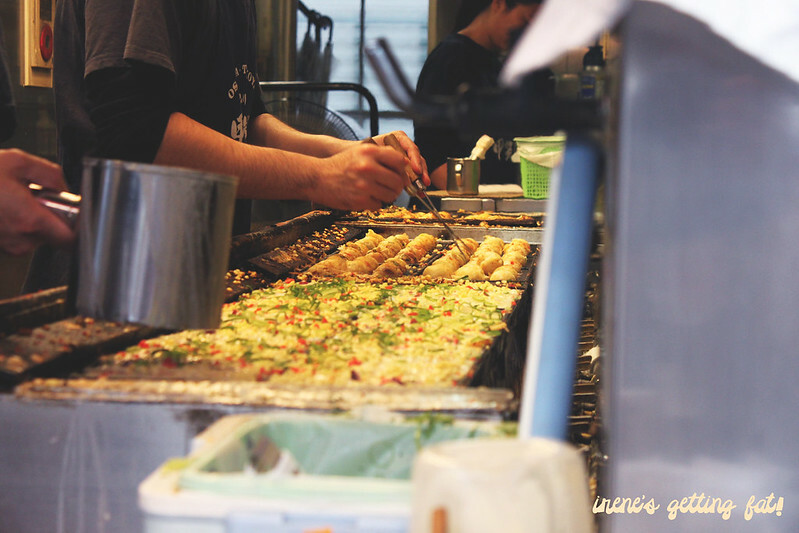 Kogaryu takoyaki. About $10 per portion. 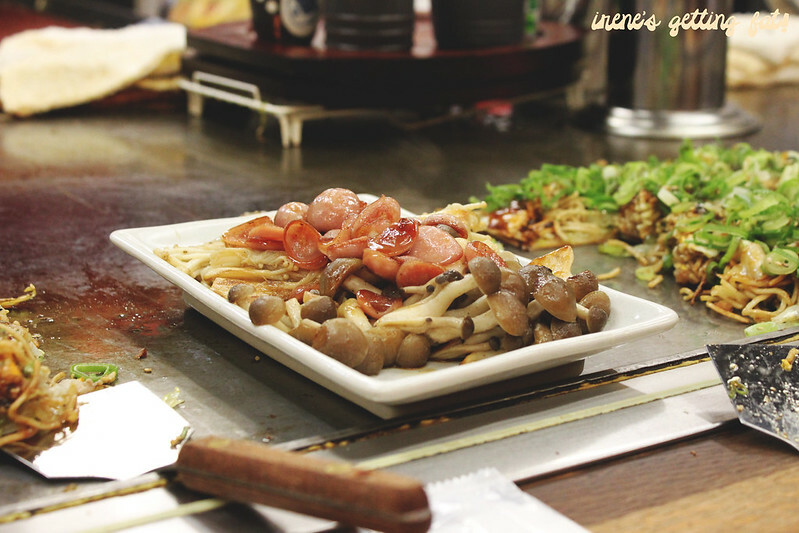 Okonomiyaki is another dish that Osaka specializes in, and we made sure we try it once before we left. 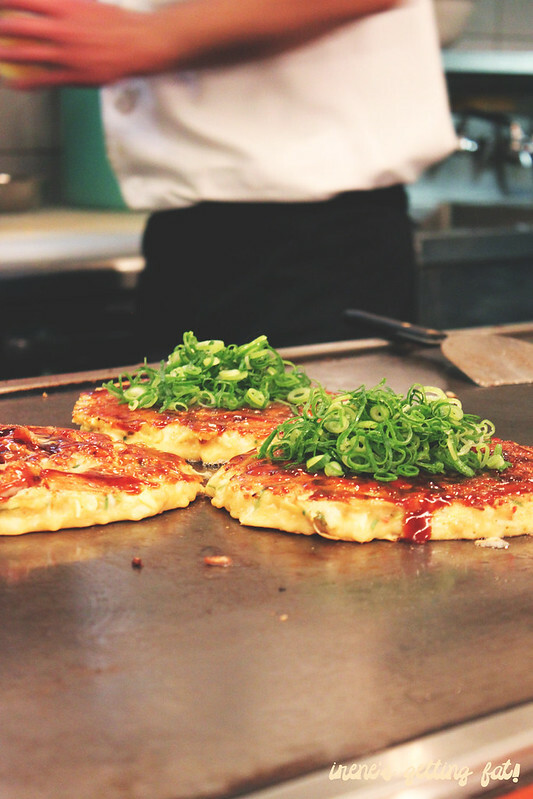 Osaka's okonomiyaki is like Japan's omelette, all ingredients are mixed with eggs and put on the hot pan. 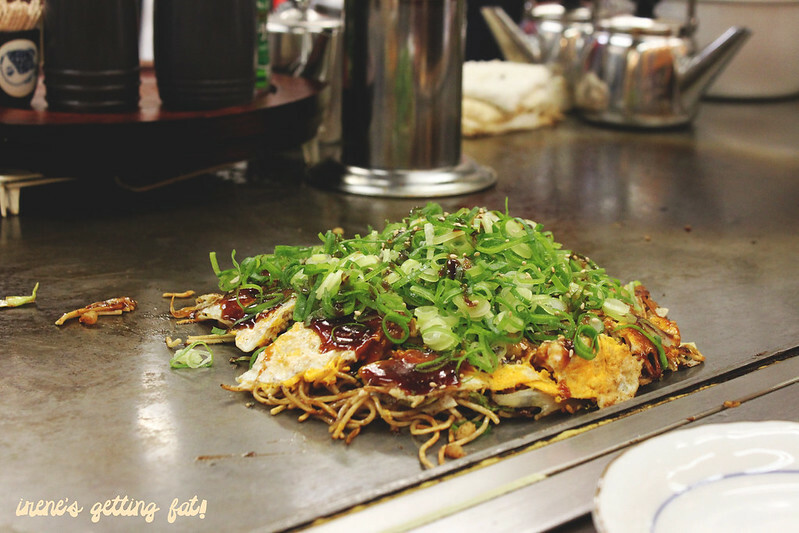 Noodles then added in the ensemble, and you can even choose your preferred type of noodle at Kiji Okonomiyaki (about 10 mins walk from Osaka Sta). There isn't an English menu, but the chefs seemed to be pretty used to foreigners and were more than happy to explain the menu and helped us choose. We had pork and seafood okonomiyaki which was pretty good, only I found it slightly too sweet from all the okonomiyaki sauce and kewpie mayonnaise. 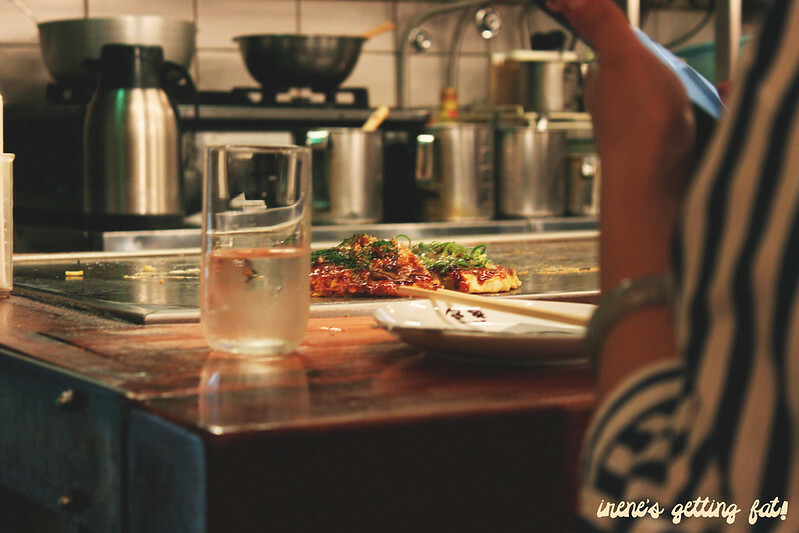 Taking photos of other people's food because I was hungry. Making my okonomiyaki! This one is the noodle one. We shared two okonomiyakis. 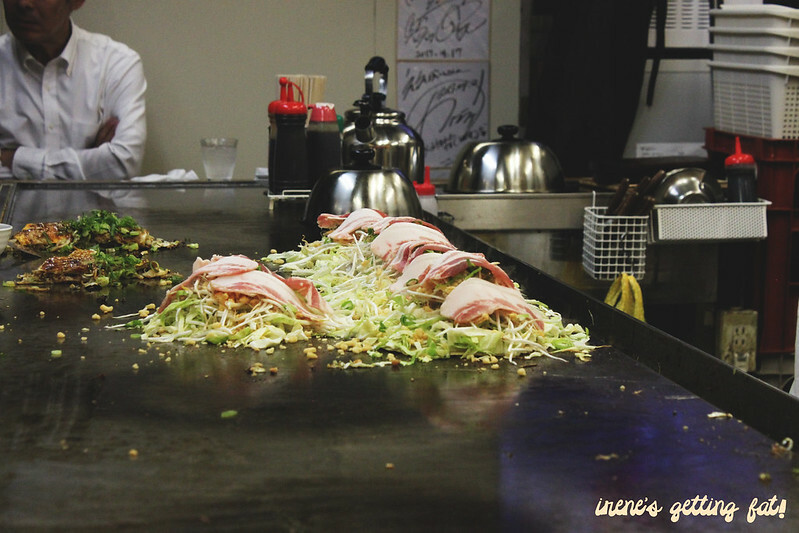 Okonomiyaki, ready to serve. We spent about $30 for two. 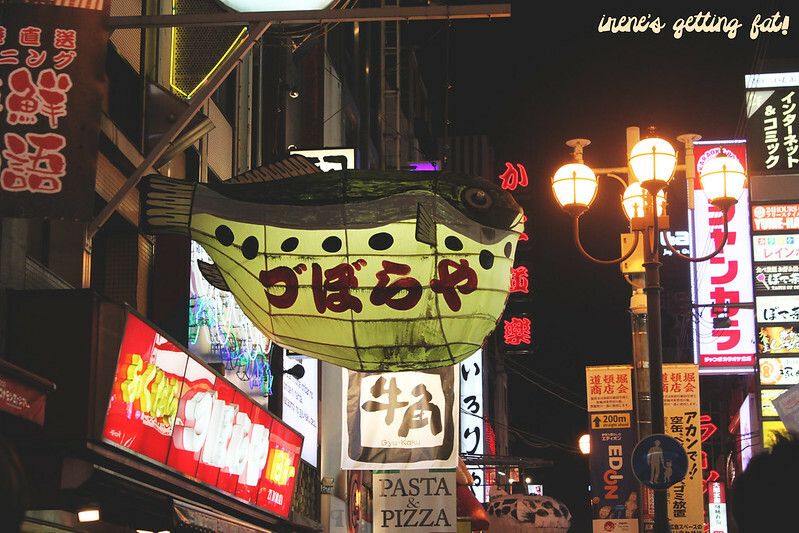 Even if you don't do anything else in Osaka, Dotonbori is somewhere you just have to see. It is an amazing place at night. It's full of people - eating, walking, taking photos, and more. 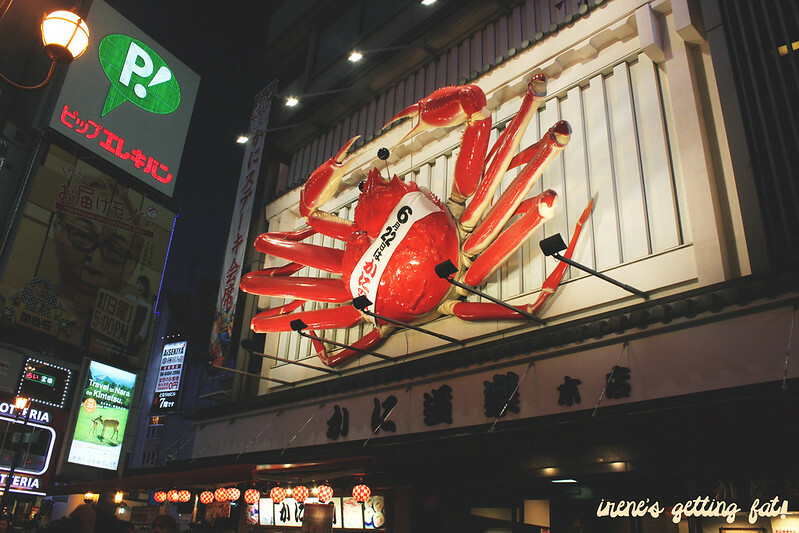 The restaurants seem to put on their best to attract customers - giant fugu fish, massive octopus, and the famous monster crab. Selfies here are a must. 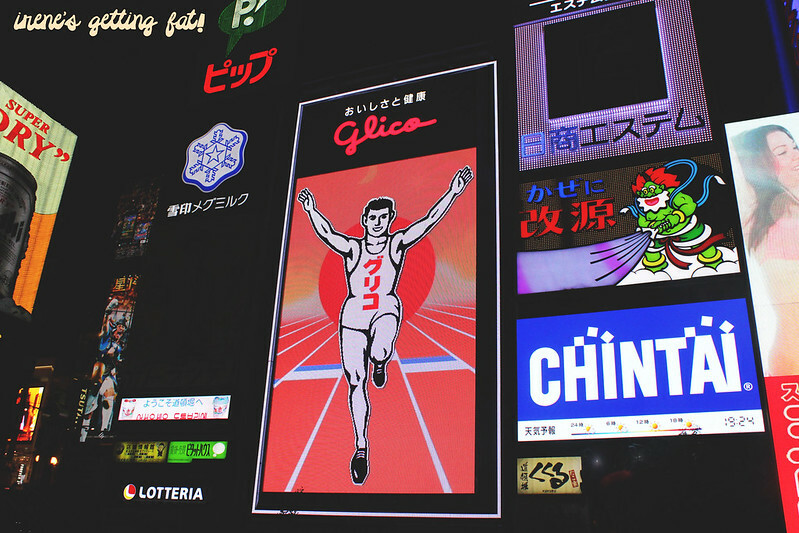 Not to mention the giant Glico man and Asahi billboard. It's beautiful and quite mesmerizing. 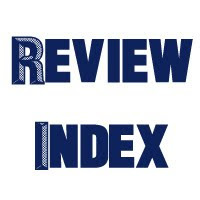 Take a stroll around and pick a restaurant to have dinner & drinks. We stopped by Gyukaku Yakiniku, an all-you-can-eat yakiniku place with all-you-can-drink policy for a little bit more to pay. 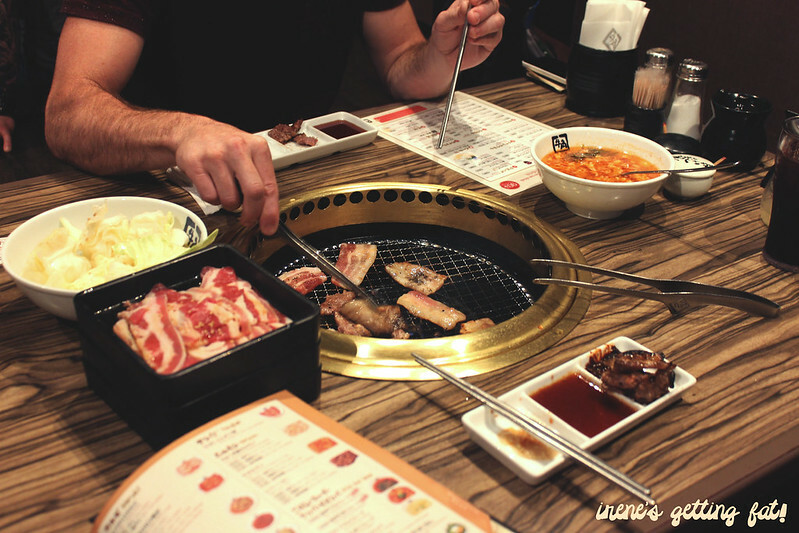 Gyukaku Yakiniku - all you can eat BBQ. Many say Hiroshima is boring and it's not their 1st preference of a city they would visit. Visit Hiroshima. Definitely. Cannot stress this enough. Yes, it's slower than Tokyo or Osaka. Yes, there's much less temples in it than that in Kyoto. It has, however, a really nice chill vibe that is unique to it. Hiroshima Peace Memorial Park is a must-visit. It's a place of such a sorrowful history, almost bone-chilling, but also beautiful at the same time. I learned a lot about atomic bomb and found myself utterly moved by the remains of the victims' belongings. 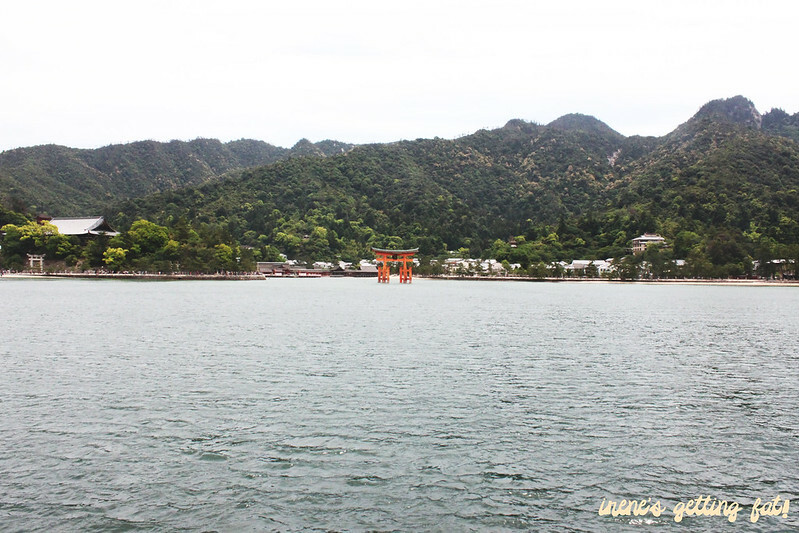 Miyajima Island is another highlight, and we were lucky enough to be able to kayak to Itsukushima Shrine and the torii gate in the sea. There's also this shopping street in the island, which has various snacks that can be bought and enjoyed while sight-seeing. Just watch the deers, they might eat your snacks. Or even your map. The tori gate of Itsukushima Shrine. Watch the deer! This one's antlers were already made dull, while the deers in the forest are actually wild deers. 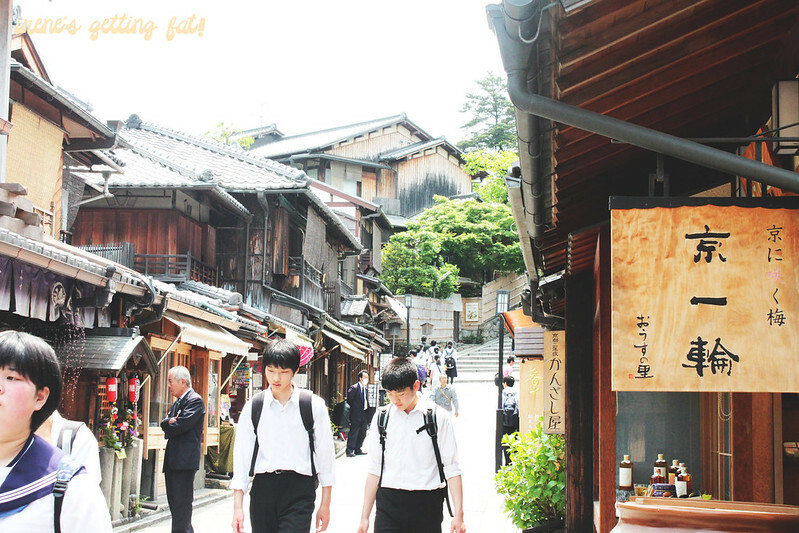 The shopping/eating street in Miyajima Island. 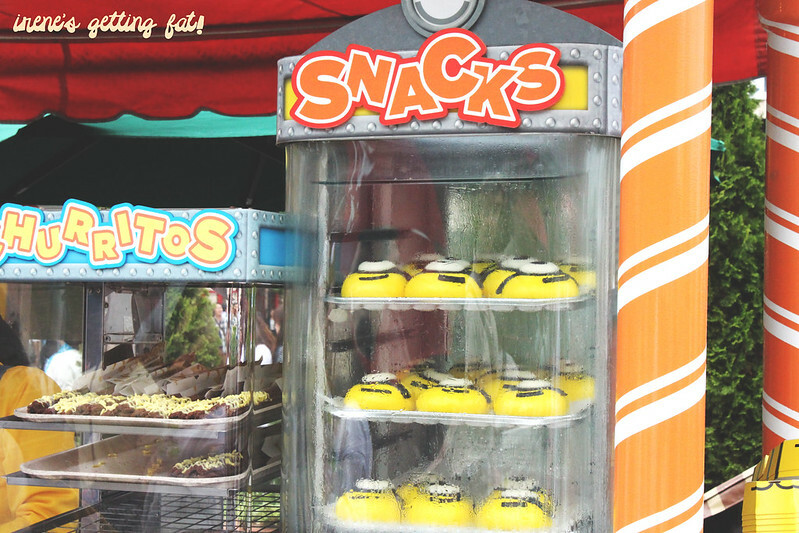 There are restaurants, snack shops, souvenir shops, and more. Grab a map at the train station and you'll find these streets very easily. Sweet potato ice cream. I wonder how it tastes! 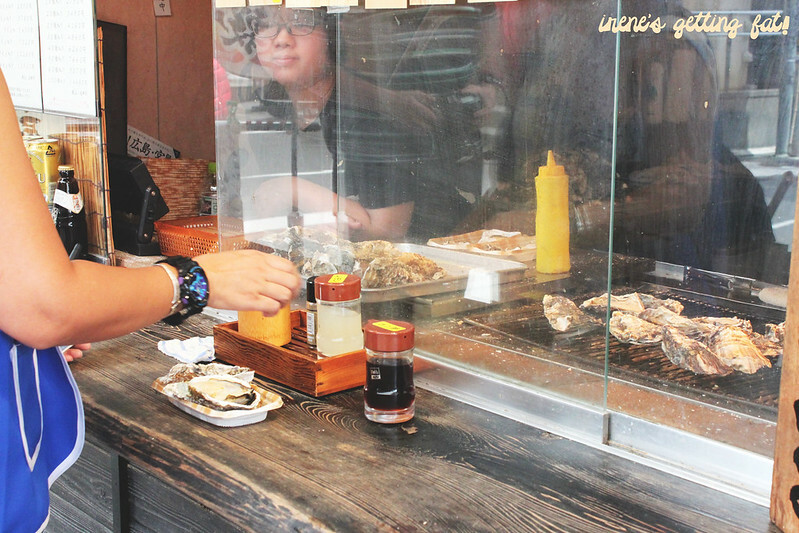 One of Hiroshima's specialties: oyster. Since it wasn't oyster season, the oysters aren't sourced fresh from the farm this month. We aren't a fan of oyster so we didn't even touch it. They are humongous! 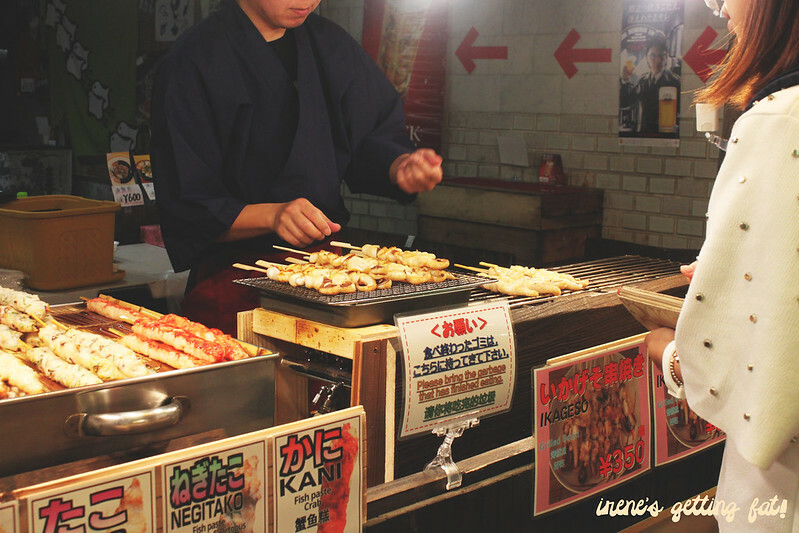 The grilled ones are popular, served with a bit of vinegar and soy sauce. Katsudon from a random restaurant. It was pretty good too! Tasty egg mixture on top of crispy pork katsu. Even better with Japanese 7 spices. 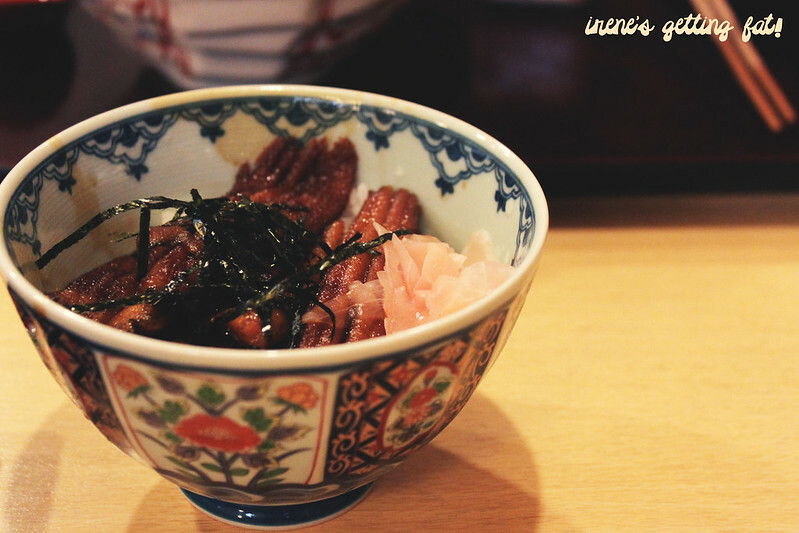 Unagi don - grilled eel over rice. 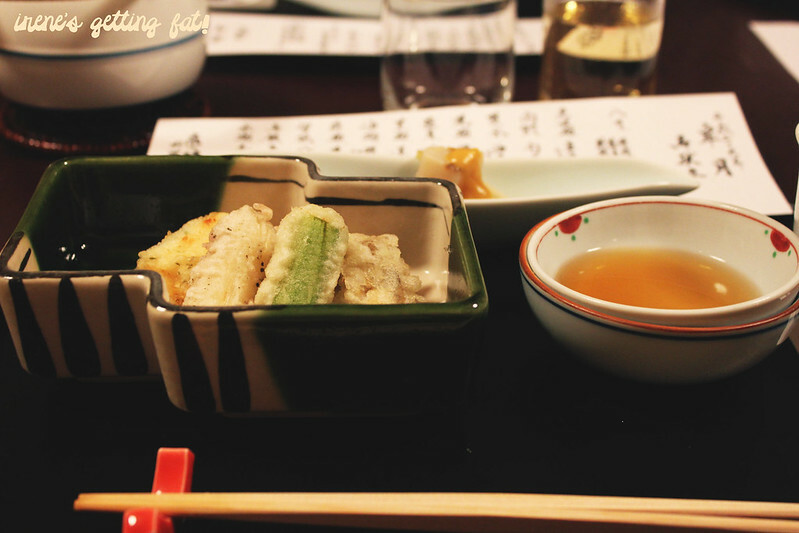 The unagi (eel) was nice, it was just a little bit too sweet for us. 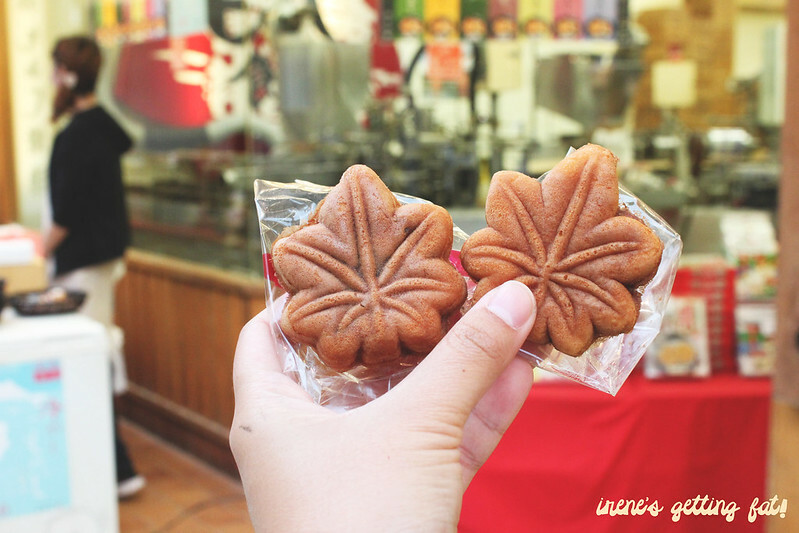 Momiji mandoo, easily one of the best things I ate in Japan. It's like soft cake shell filled with various types of filling, like red bean, crushed red bean (red bean without skin), chocolate, custard, green tea cream, etc. They're just so addictive! Sweet and soft and the cake filling ratio is just perfect. 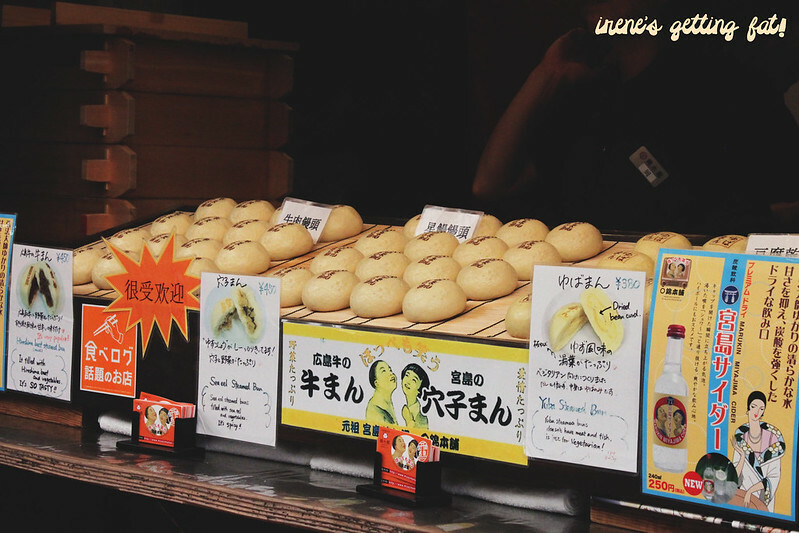 You can even see the process of making them from the window of the shops. The original red bean filling and the chocolate are the must try for me. 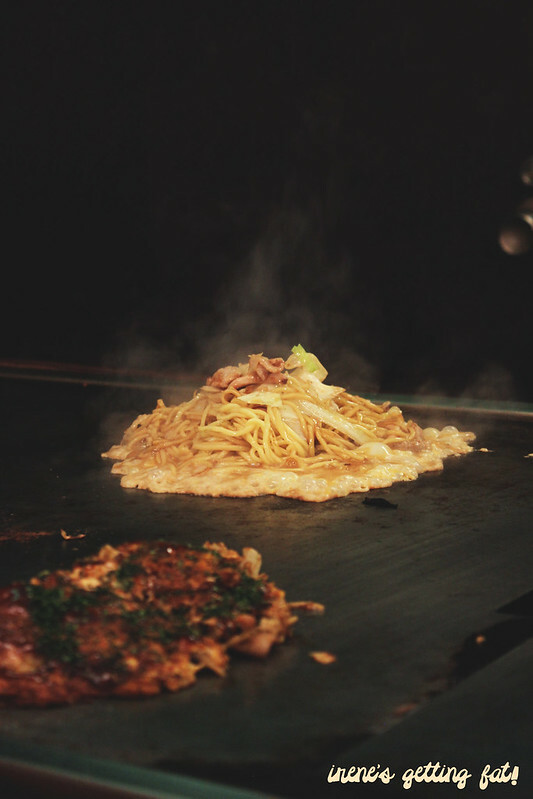 Okonomimura is literally a three levels of food court serving, yes you guessed it, okonomiyaki. 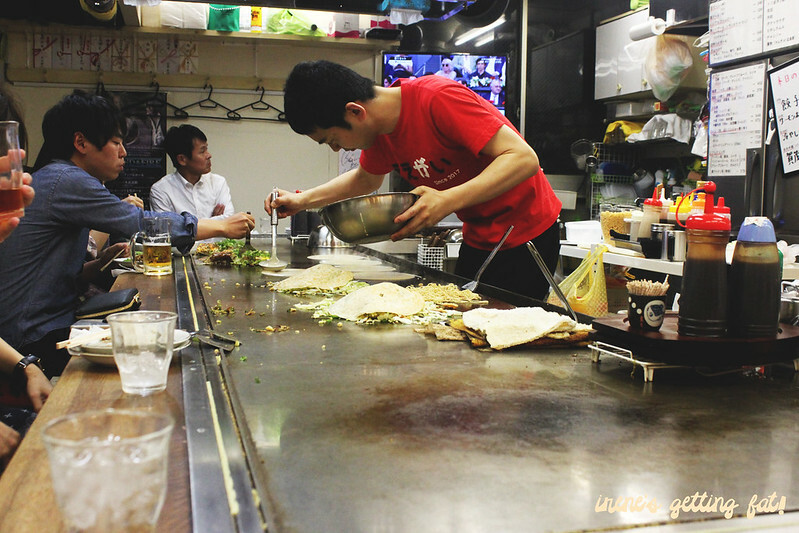 Hiroshima's okonomiyaki is different than Osaka's. 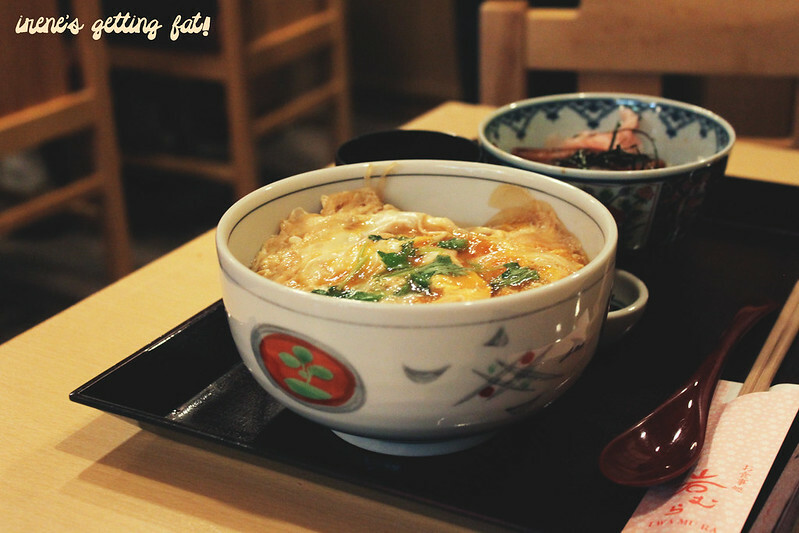 While Osaka's more like a mixed omelet and soggier, Hiroshima's crispier and, to me, tastier. 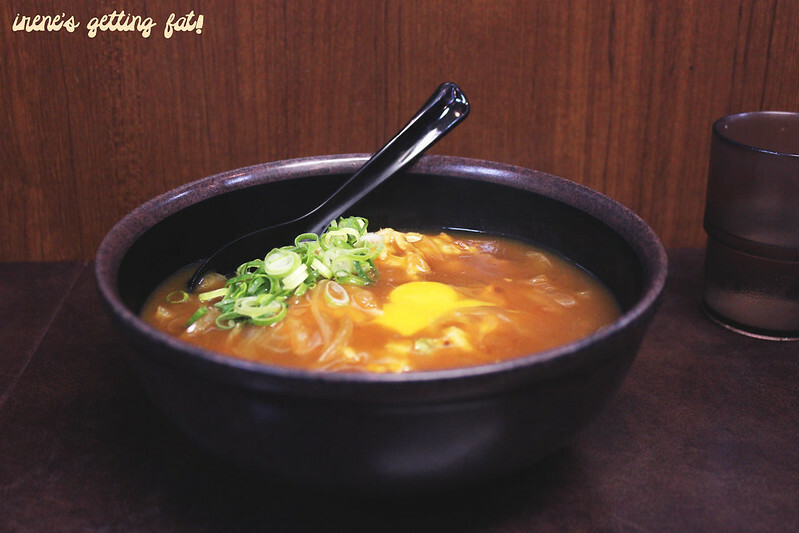 The ingredients are cooked layer by layer, creating crispy noodles on the bottom with thin layer of egg on the top. There isn't one recommended stall here, just choose one and your life will seem brighter. There's even a stall dedicated for Carp (Hiroshima baseball team) fans here. 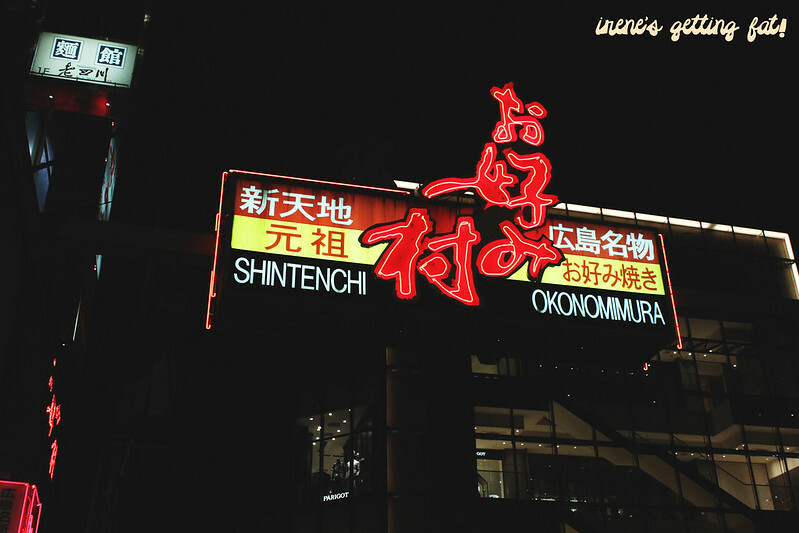 Okonomimura signage. 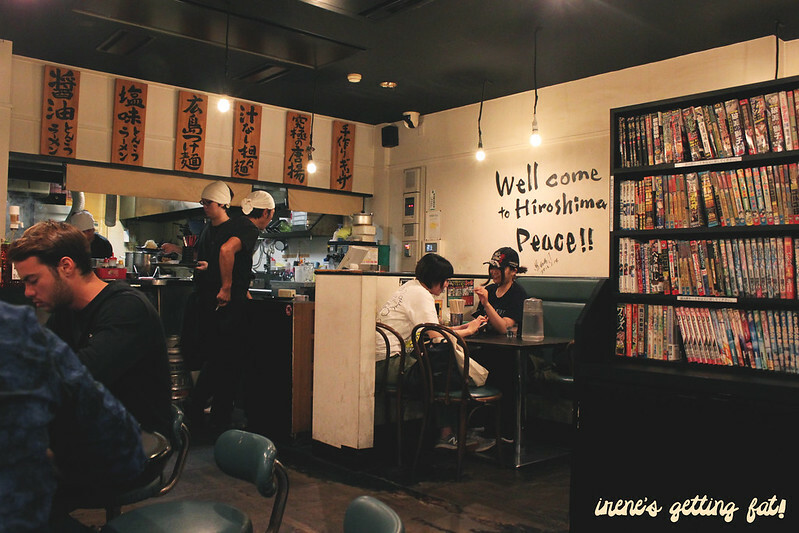 The place is in downtown Hiroshima, 3 mins walk from Hatchobori tram station. 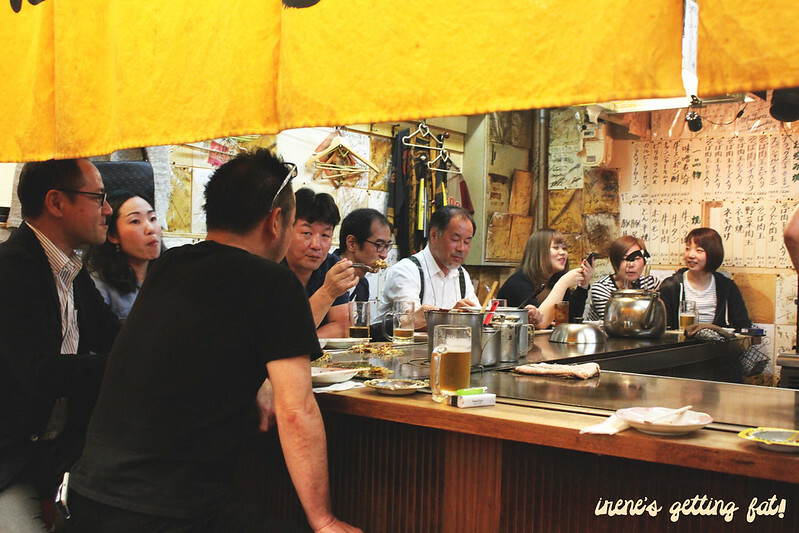 You'll find both locals and tourists, all with their glasses of beer and plates of okonomiyaki. We chose randomly and went to a corner stall on 3rd floor. Our Hiroshima Special, the one with extra bacon and fried cuttlefish. Because we were greedy we also ordered a plate of mixed mushrooms with a bit of butter. Juicy and so good. They pan fried it on the spot on the same big hot pan. 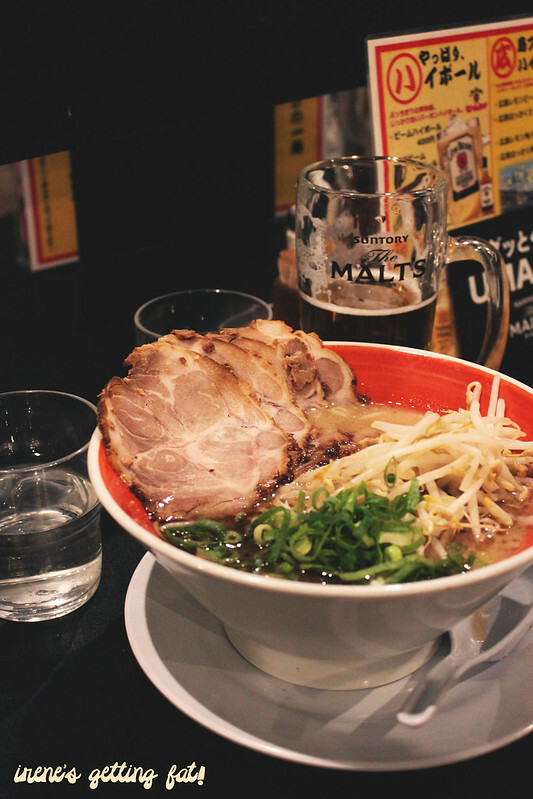 We spent our last night in Hiroshima in its red light and entertainment district, and made our way to Fujiwara Ramen. English menu is available and the place is cosy. There's a rack of manga to read while you wait. While David had the light but hearty soy-based tonkotsu ramen, my tsukemen was far more superior. The tsukemen was served cold, and I chose level 15 for the spiciness of the dipping sauce ('there are 20 levels! ', he said). The dipping sauce itself was light enough and had enough spicy kick. 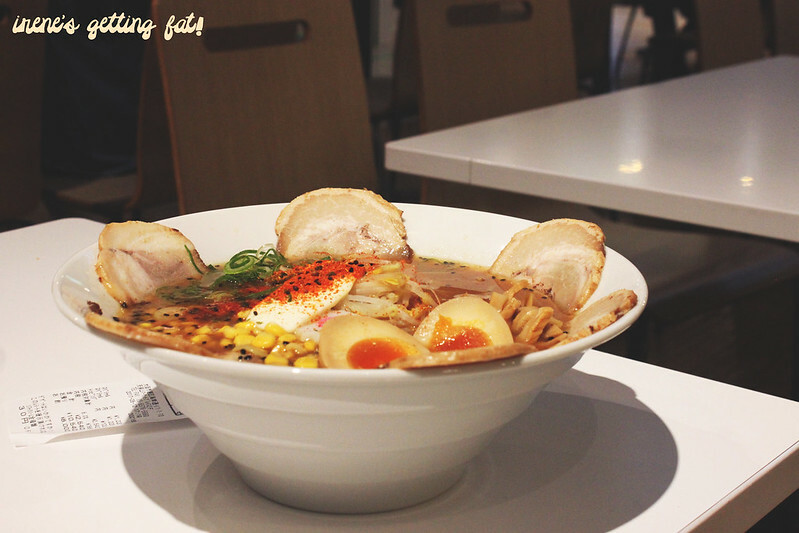 The noodles were amazing and firm, and the soft boiled egg was creamy. It was a great dinner. 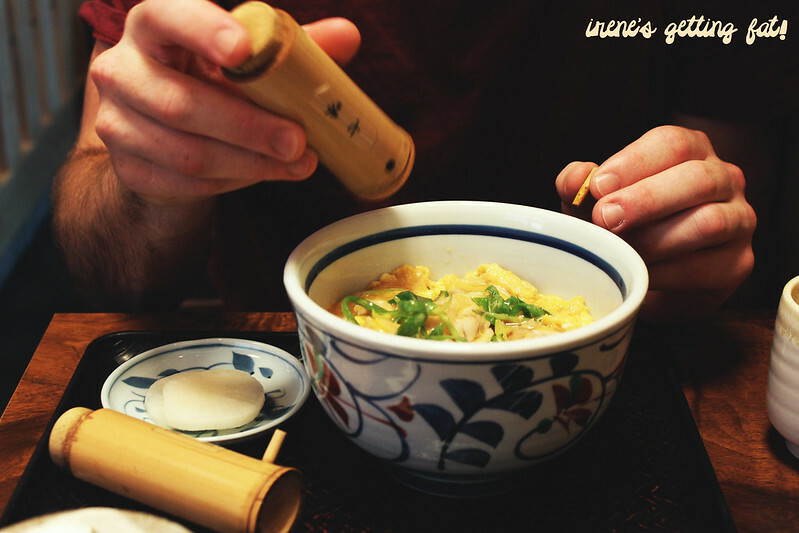 Tsukemen, with dipping sauce and a plate of gyoza on the side. There were lots of veggies in the plate - julienned cucumber, spring onion, & cabbage. The trip was no short than amazing. It was unforgettable and I will definitely be doing it again sooner than later. Until then, Japan! ahhhh so much delicious eats!!! Can't wait to be back!! 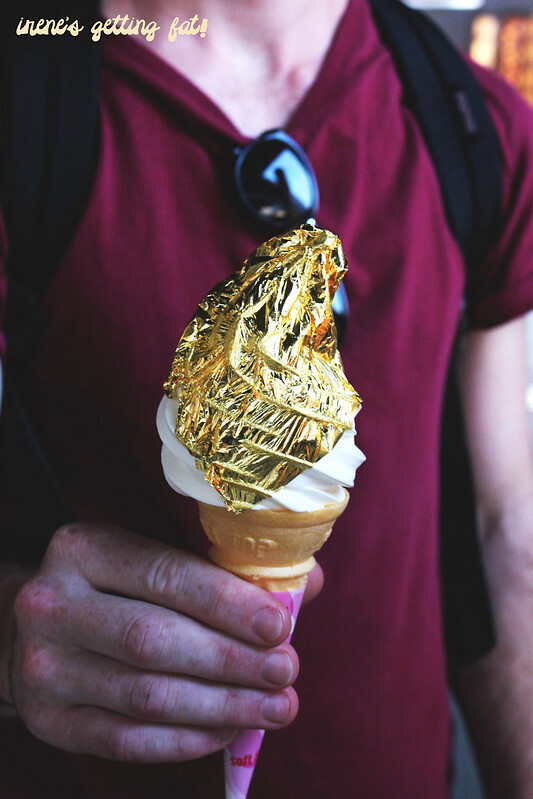 Eating that gold leaf soft serve feels so luxe! And I love the sound of the bamboo forest when the wind blows. So calming and zen! Totally does! 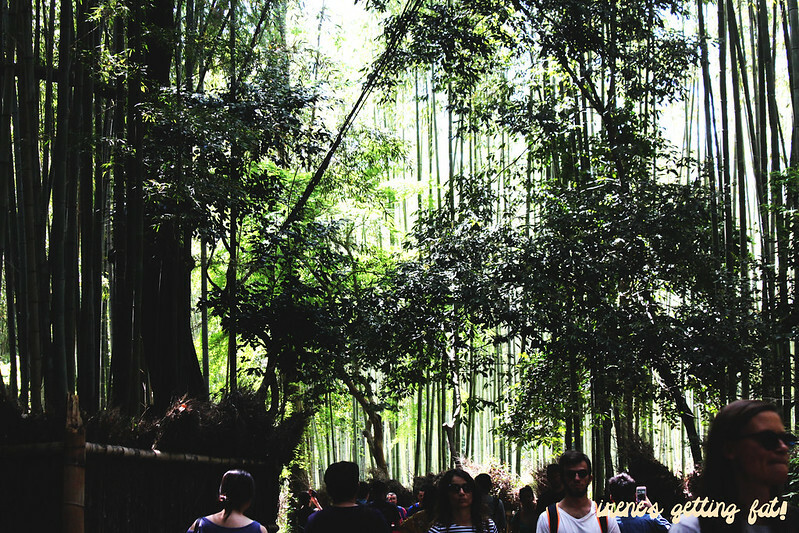 And the bamboo forest is just so nice.